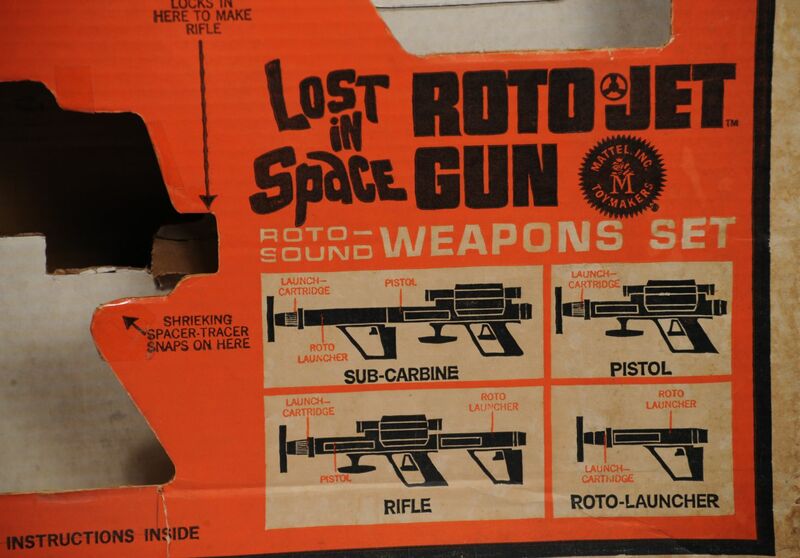 I could write a novel about this rare collectible item! 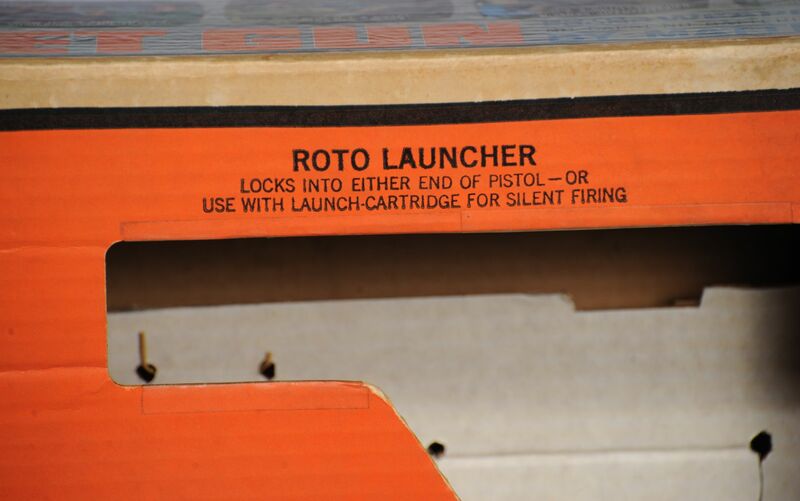 I purchased one of these several years ago, and paid $7,300. 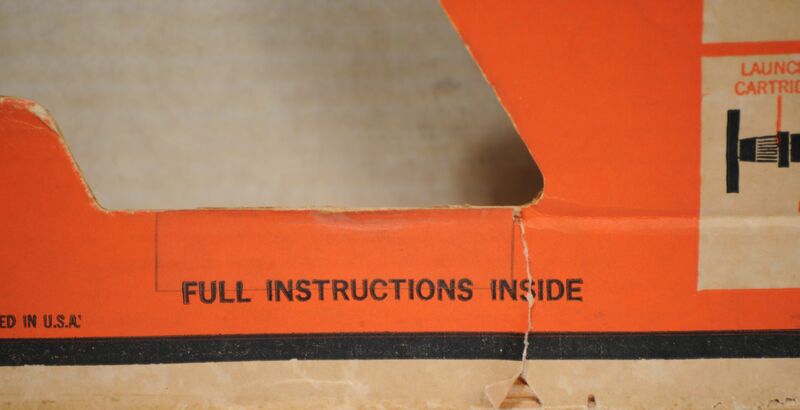 for it. 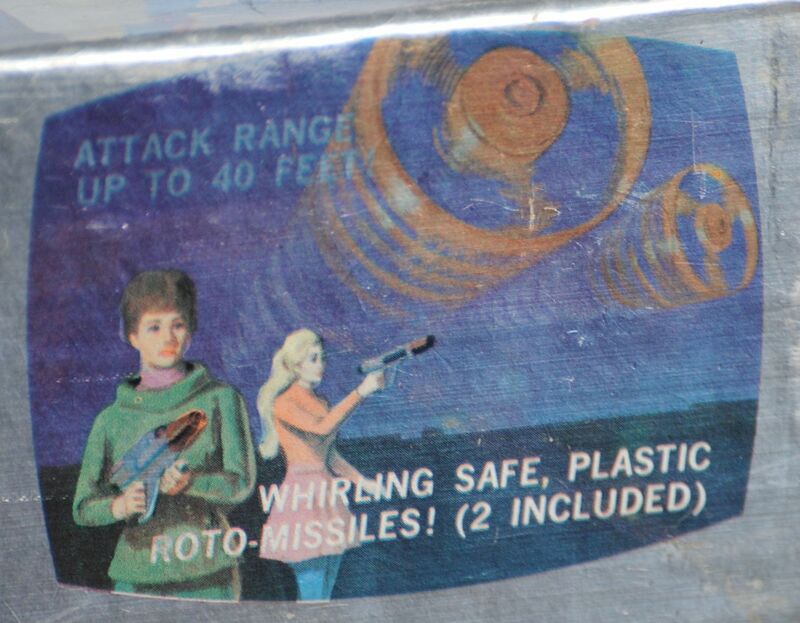 I made the front cover of "Toy Shop" on this high ticket item. 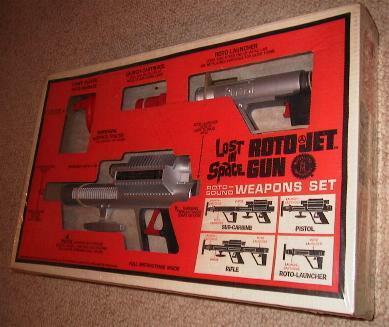 A year later, (July 03, 1999) a gentleman had one up on eBay with no reserve. 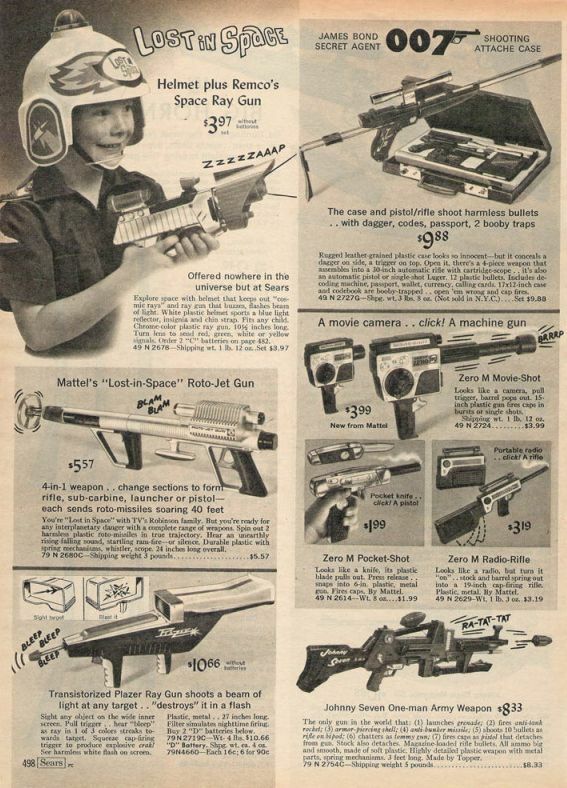 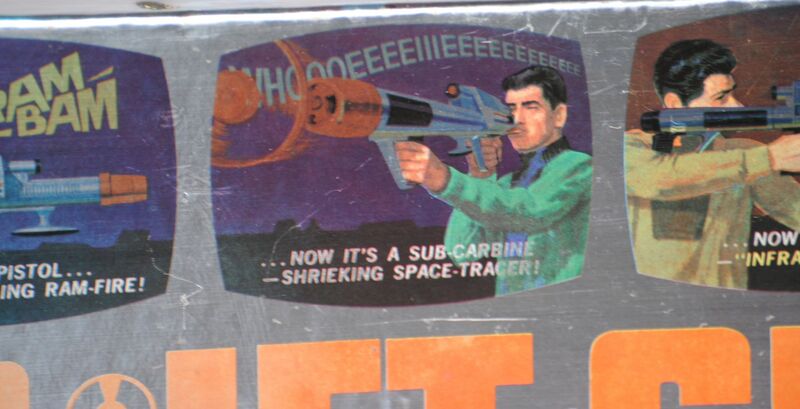 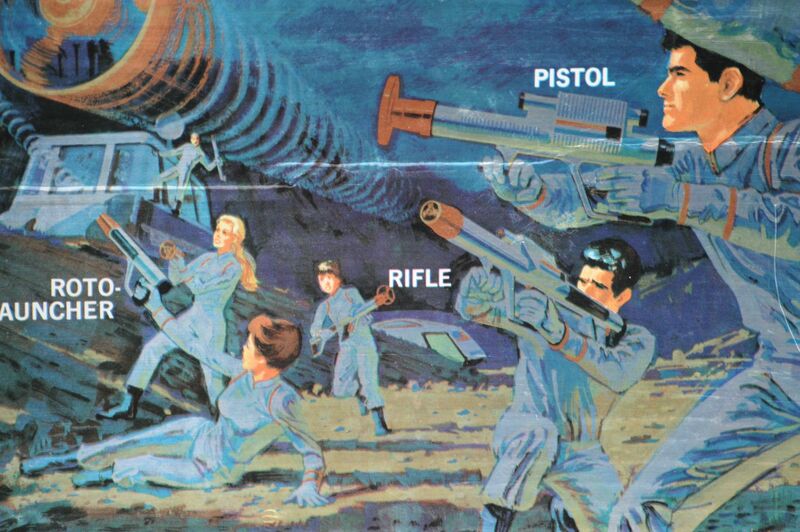 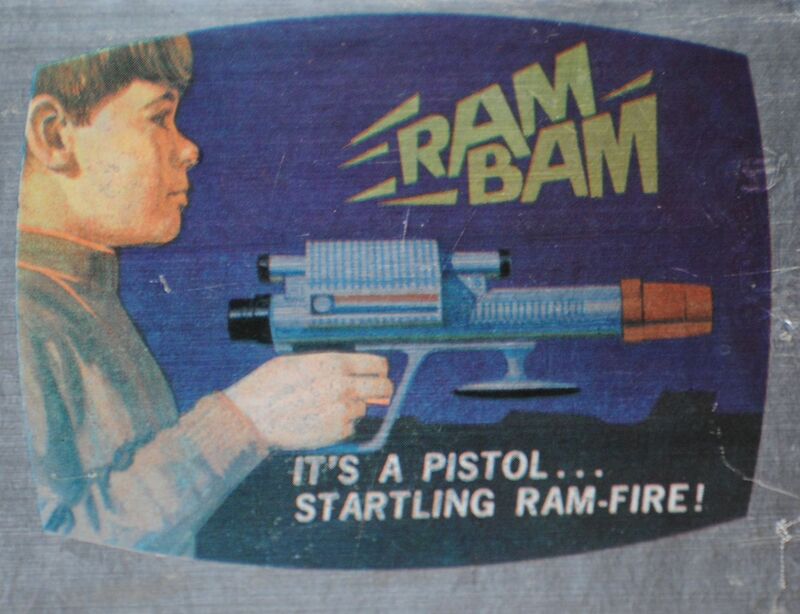 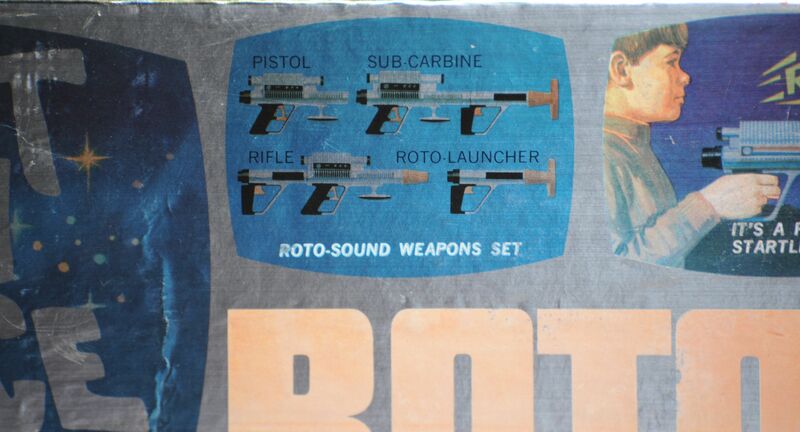 He also did not show the artwork on the box, but displayed the toy gun only. 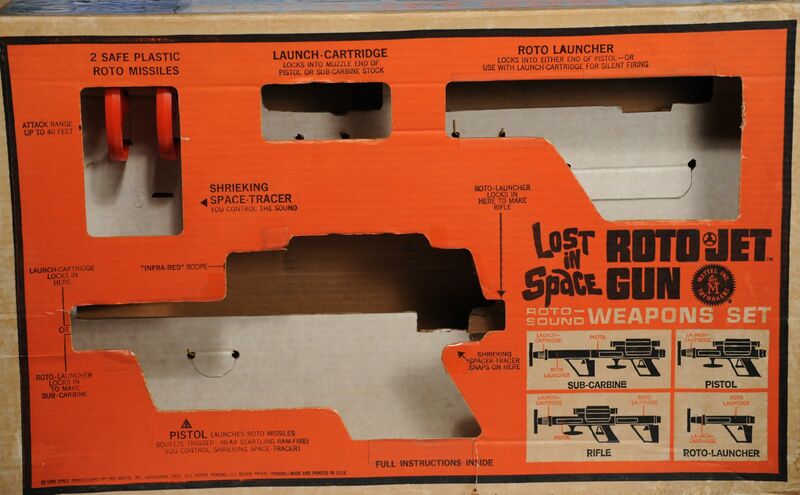 I emailed the seller and told him about the value of this toy. 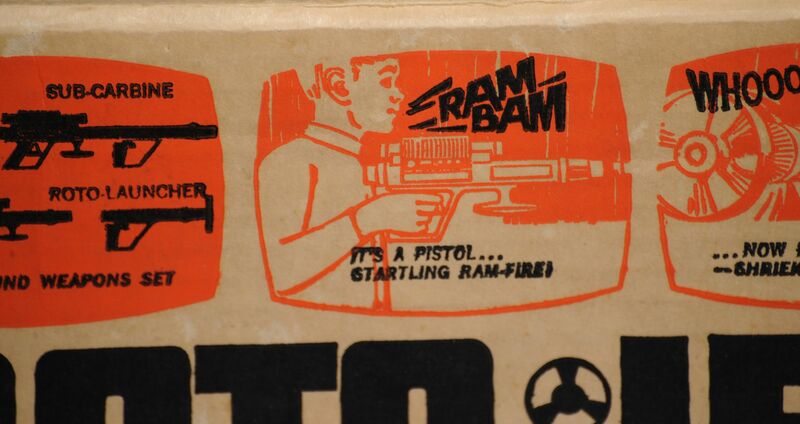 He then sent me photo's of the art on the box. 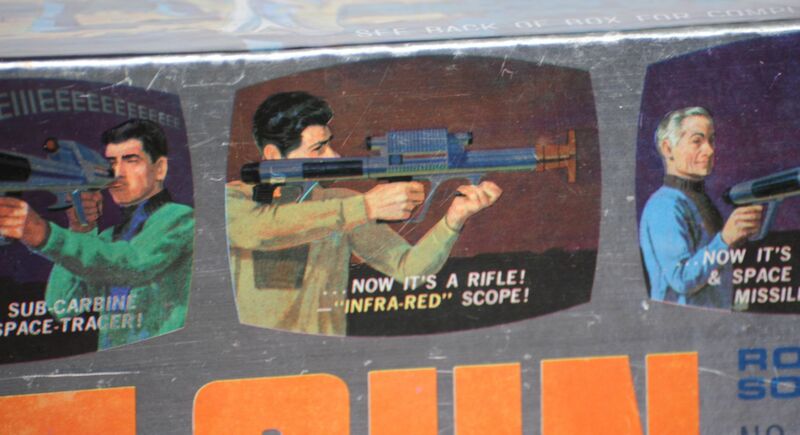 He didn't believe me that this toy was so valuable, mostly for the box art. 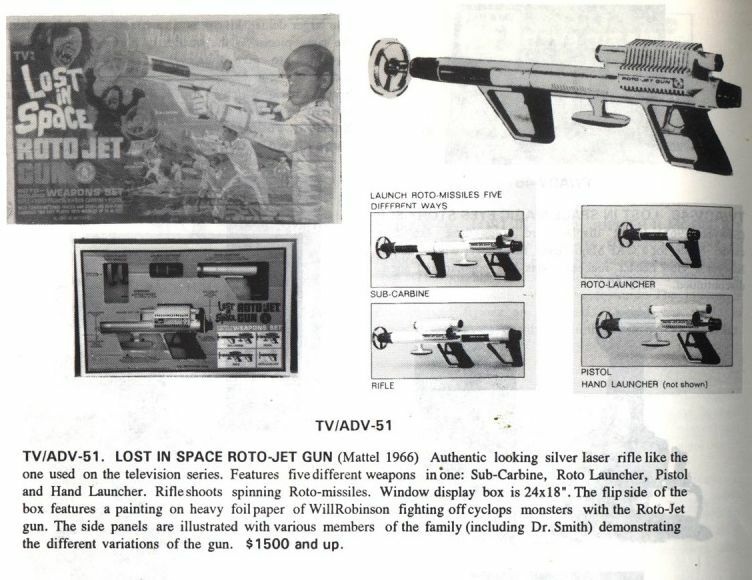 After the auction ended, he sold it for $7,400. 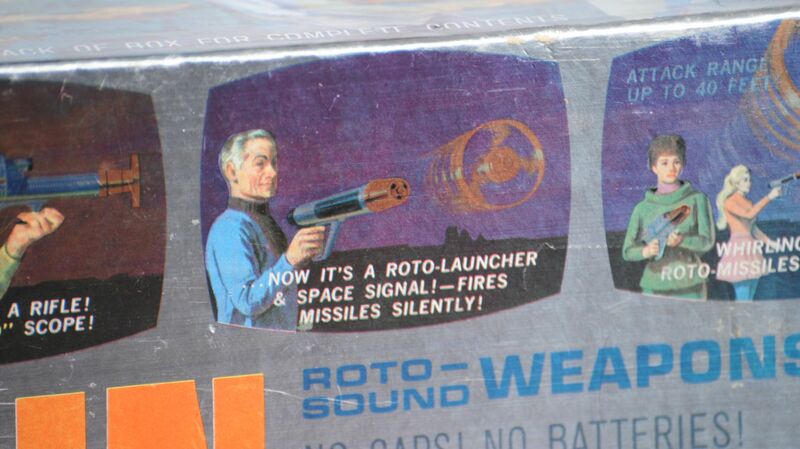 He offered me money for my honesty, and had a great wedding thanks to this toy. 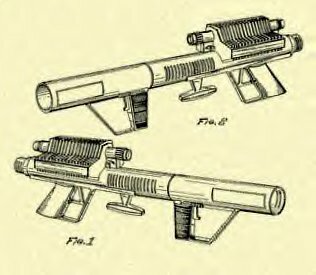 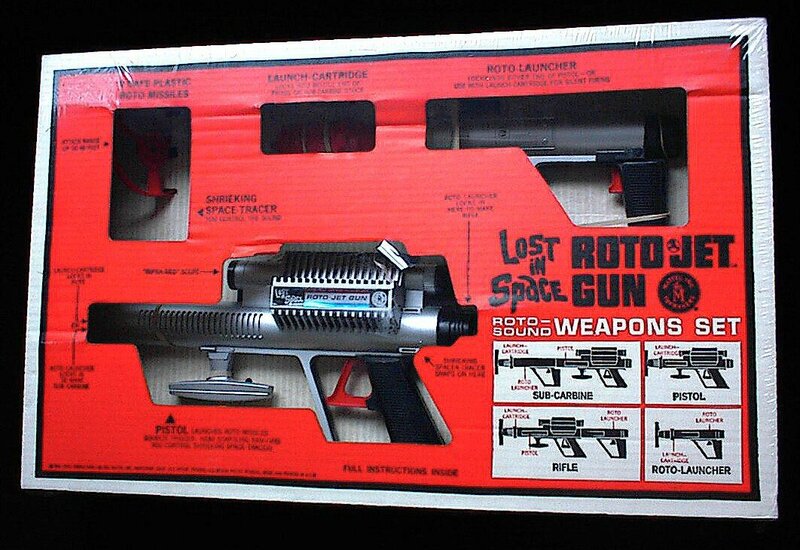 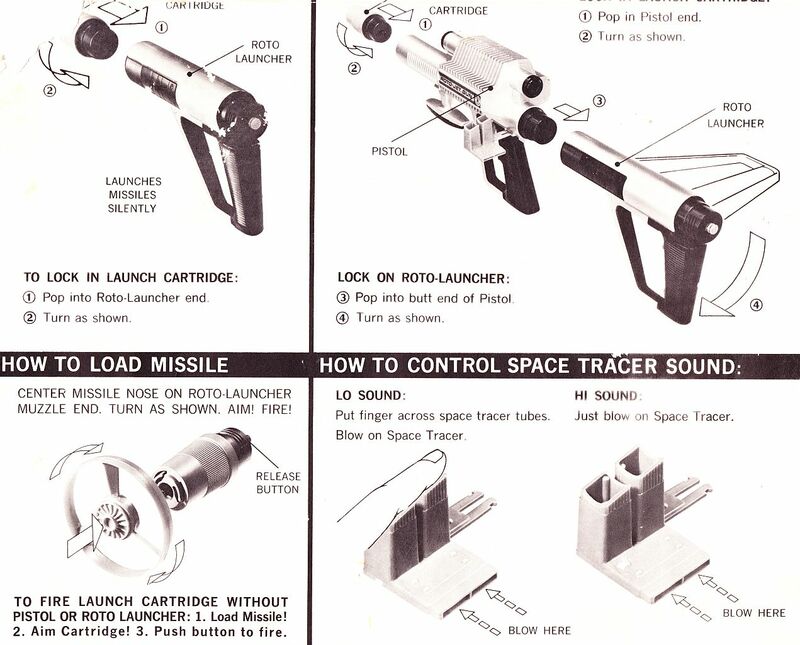 On January 16, 2000 another Roto Gun hits eBay. 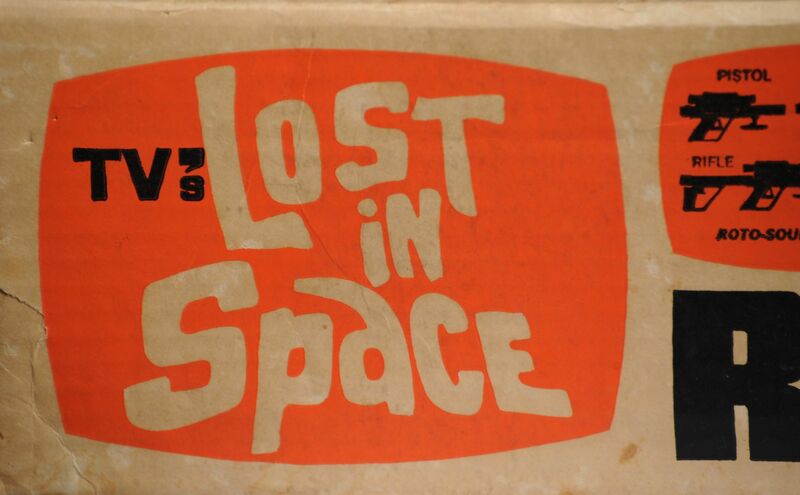 But this one had actor Mark Goddards signature inside the box flap. 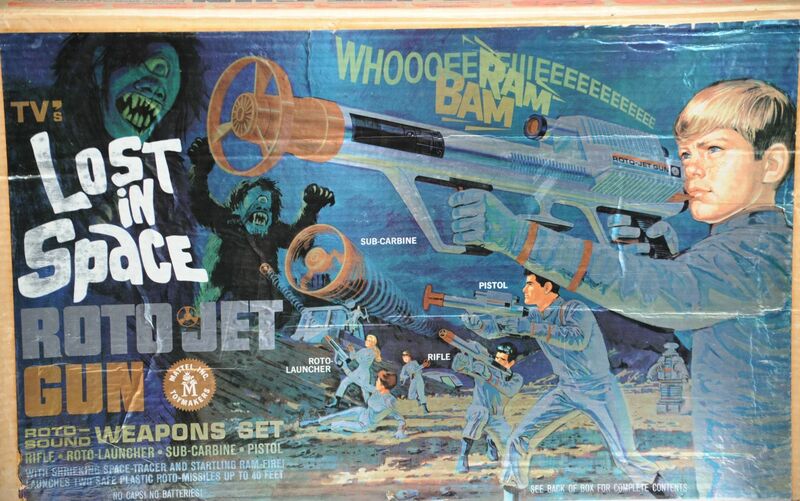 The auction ended with 46 bids, and the item sold for a whooping $15,300. 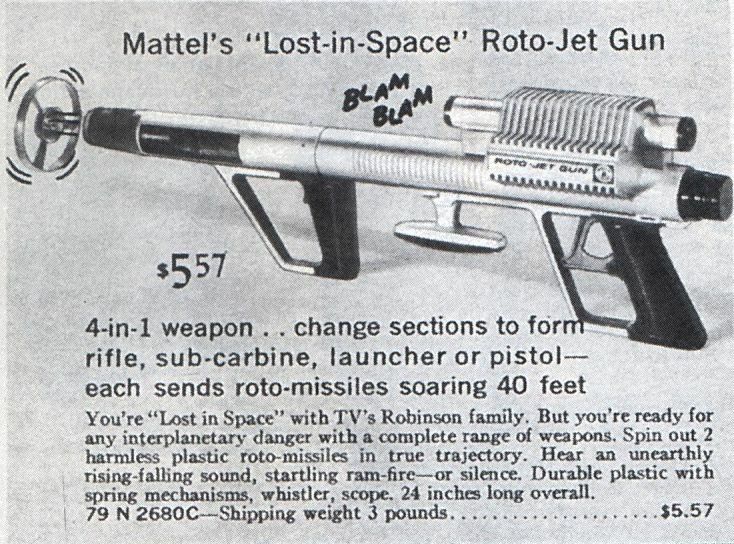 That is a record for the most ever paid for this item. 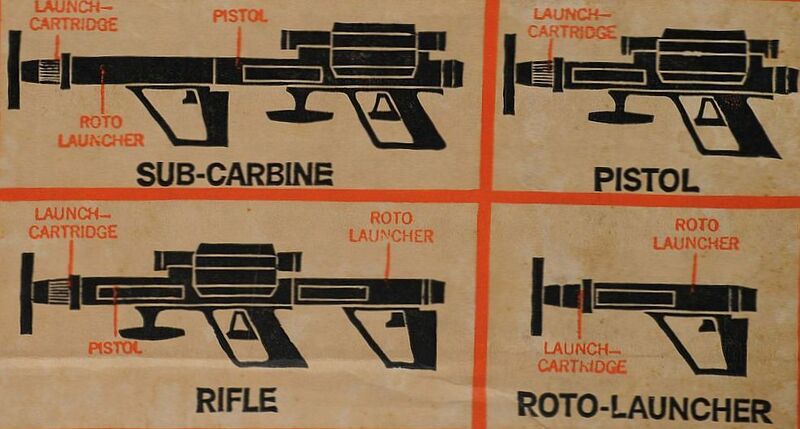 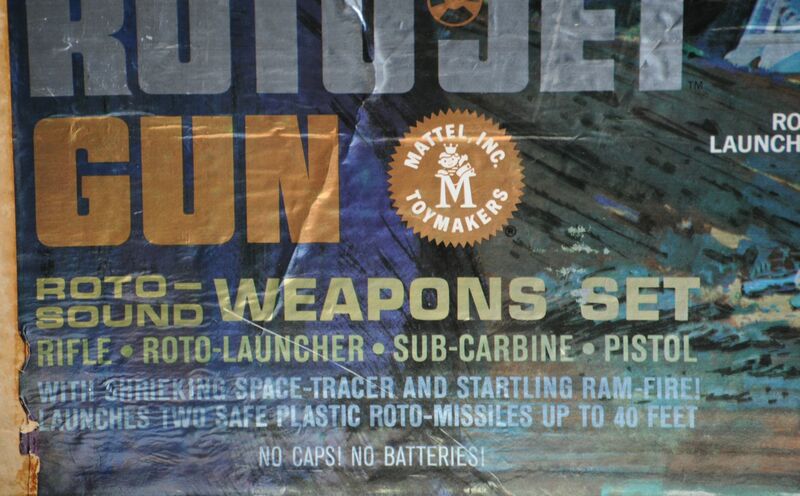 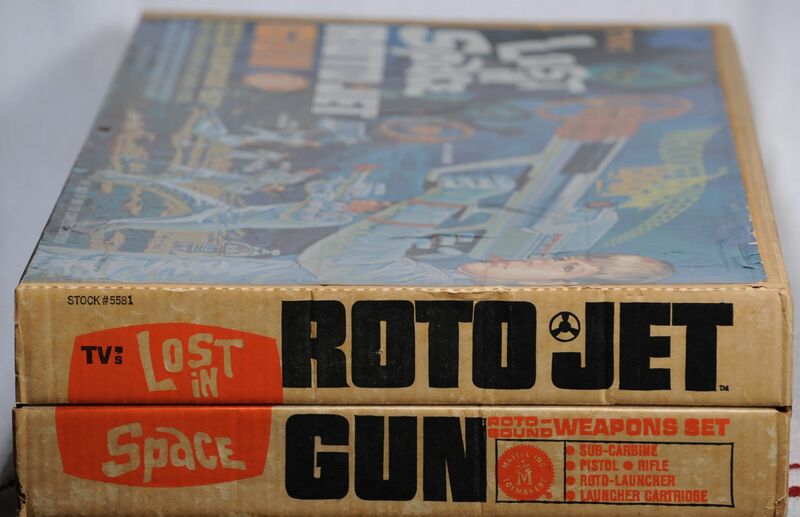 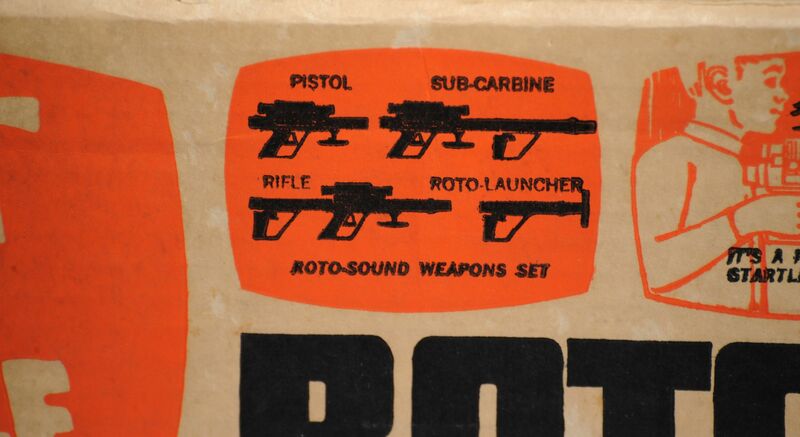 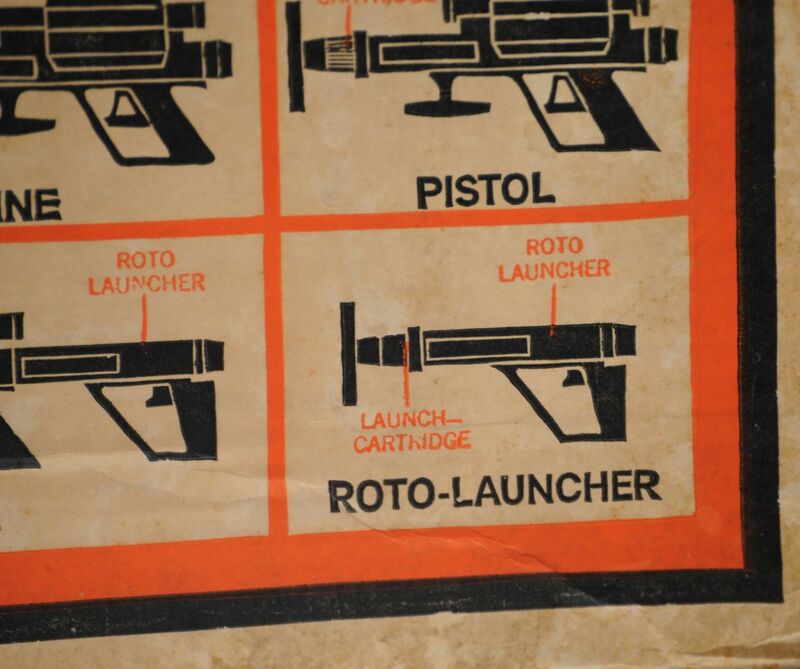 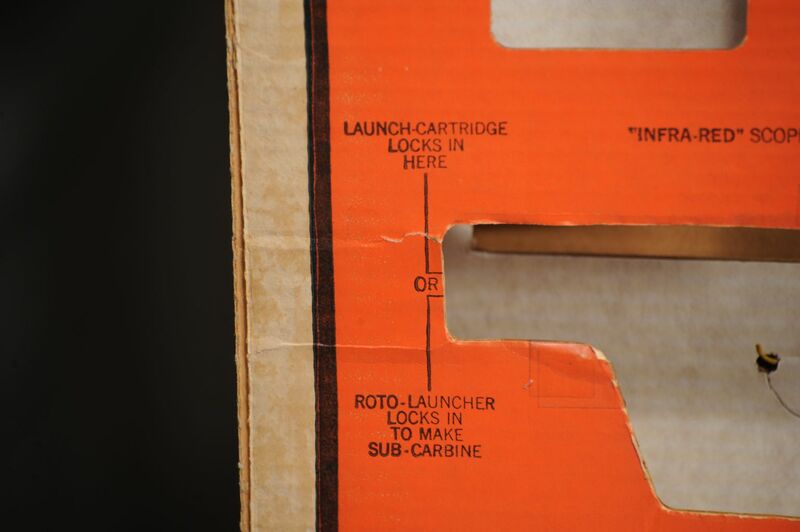 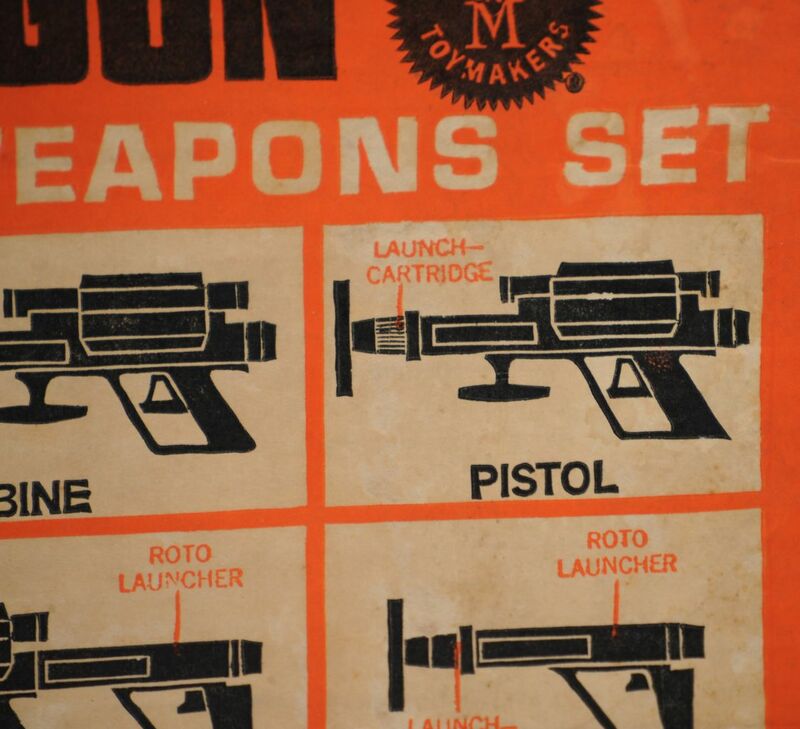 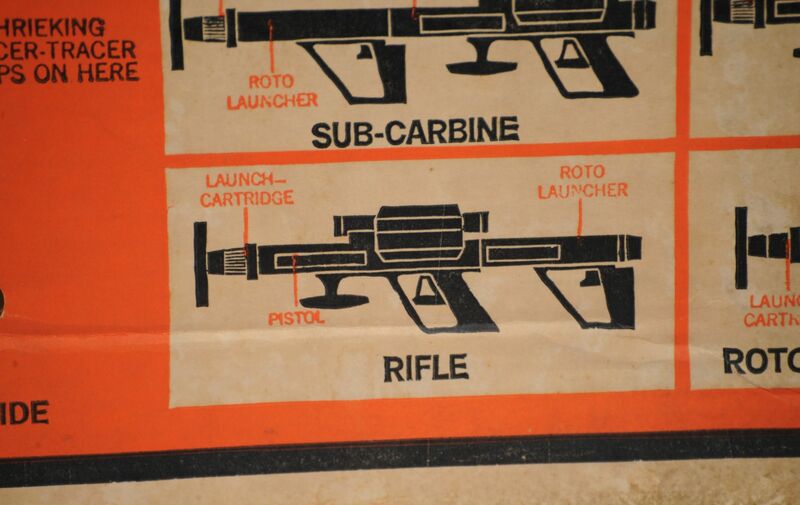 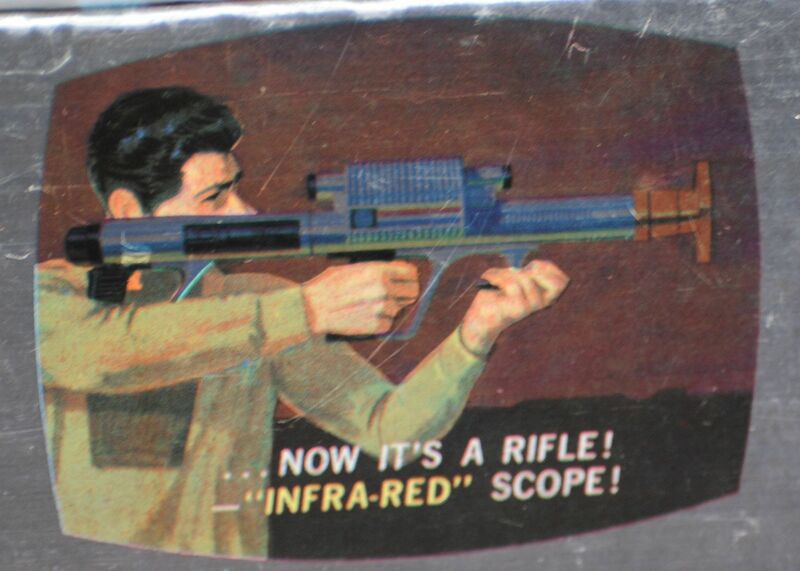 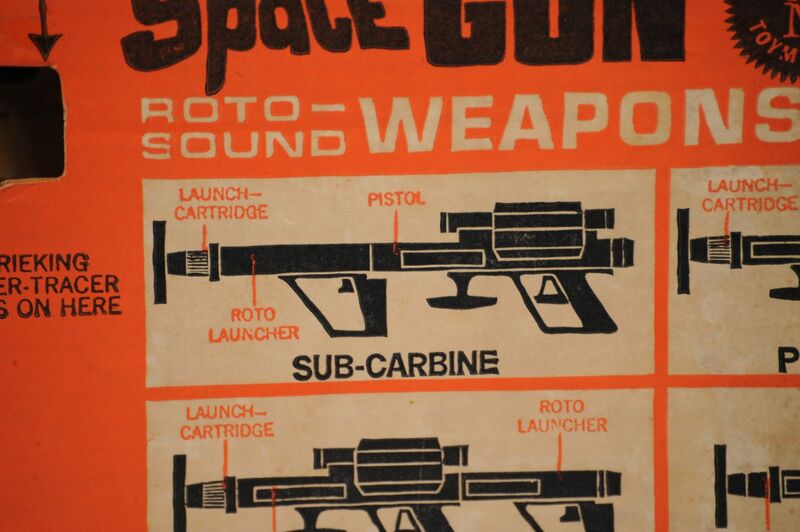 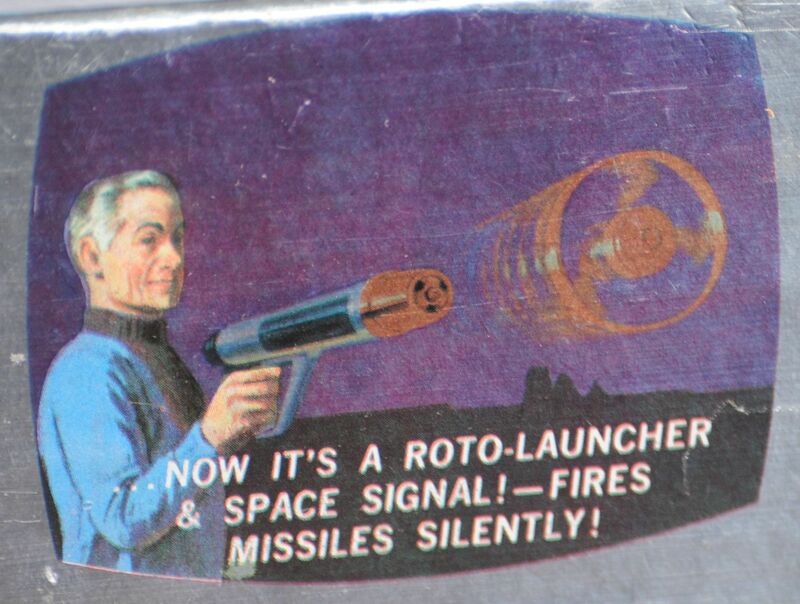 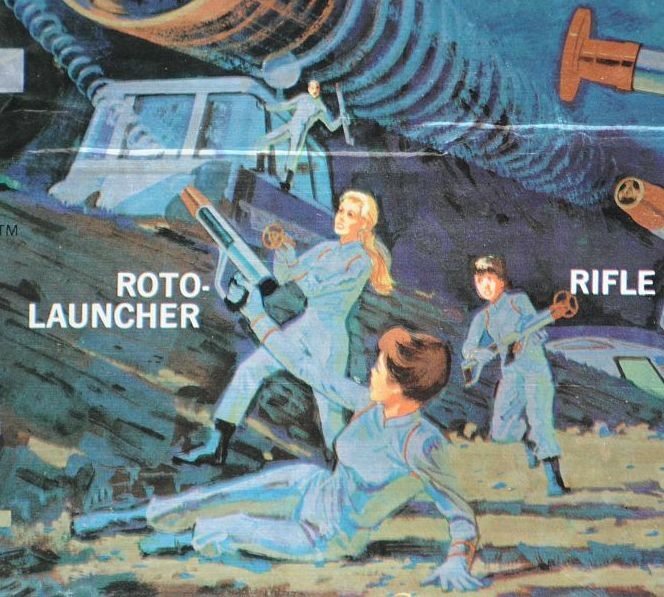 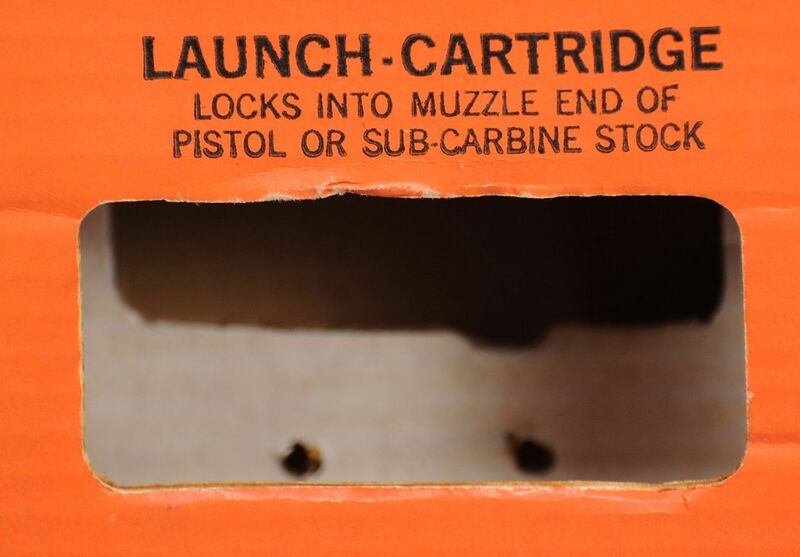 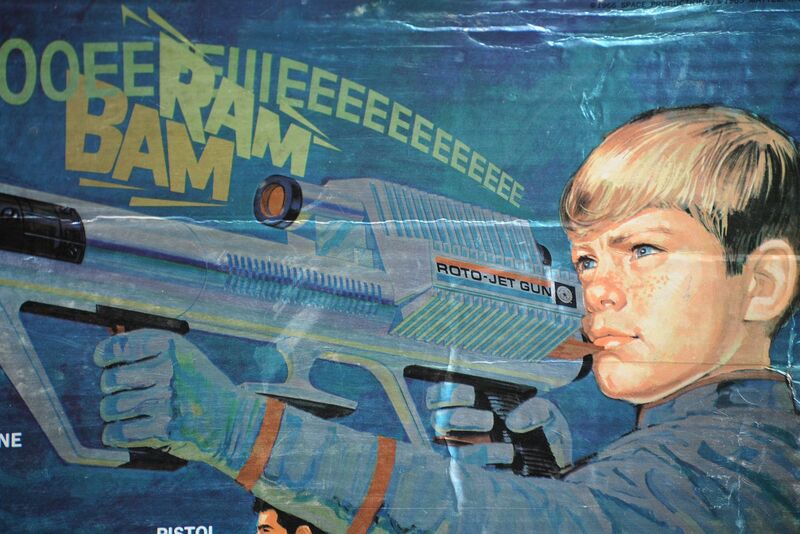 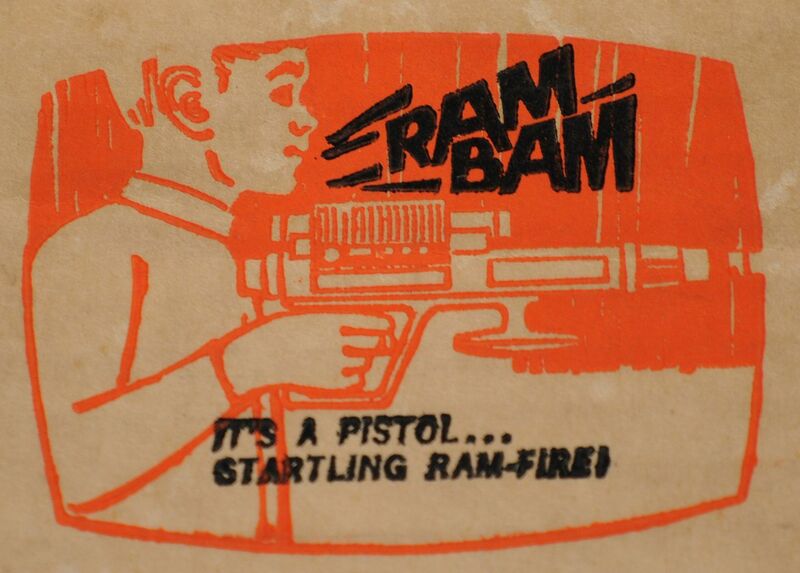 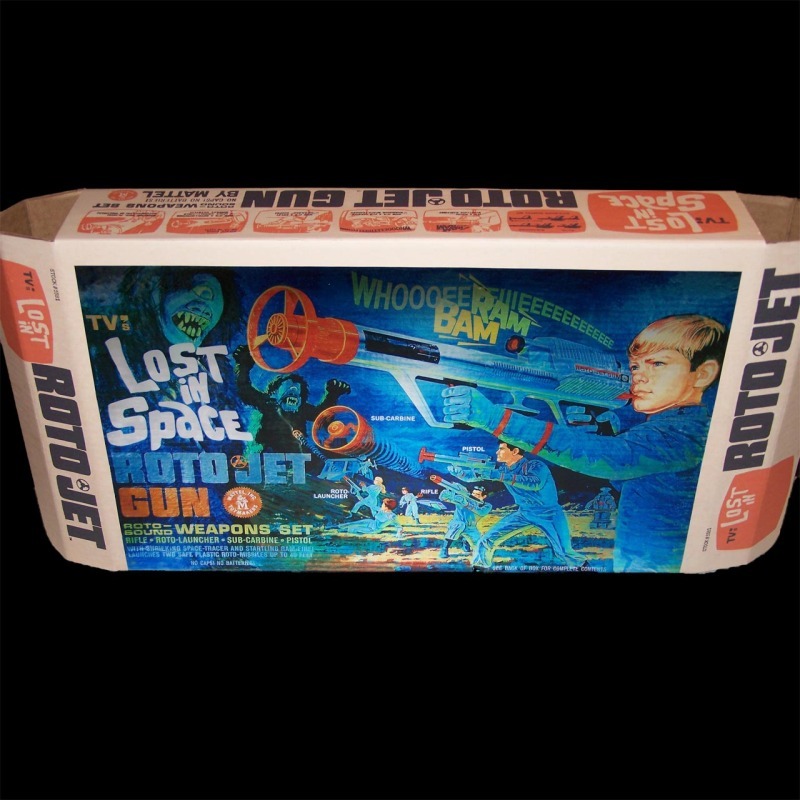 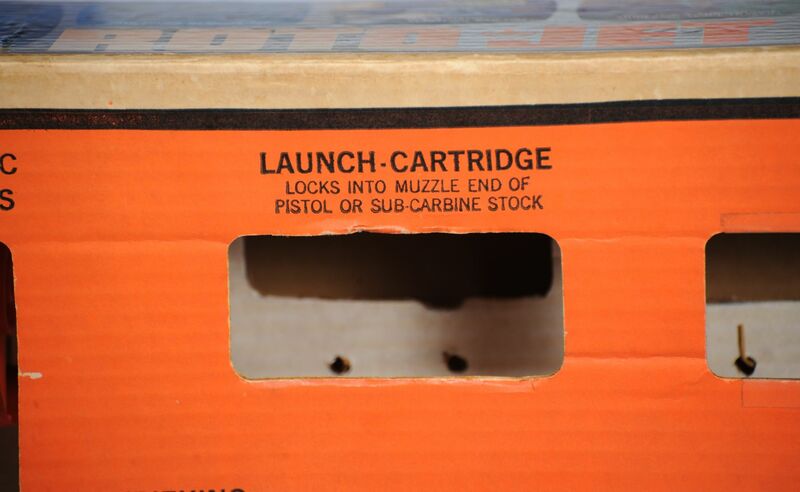 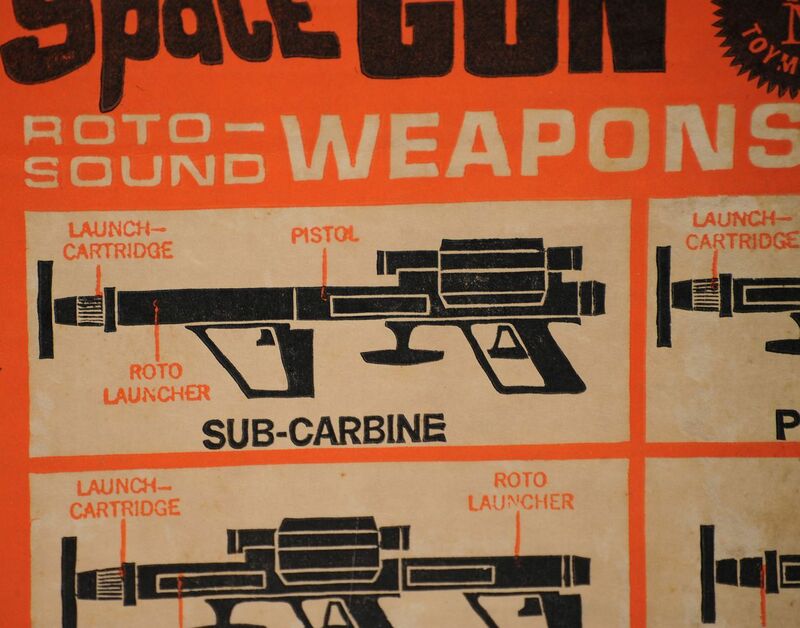 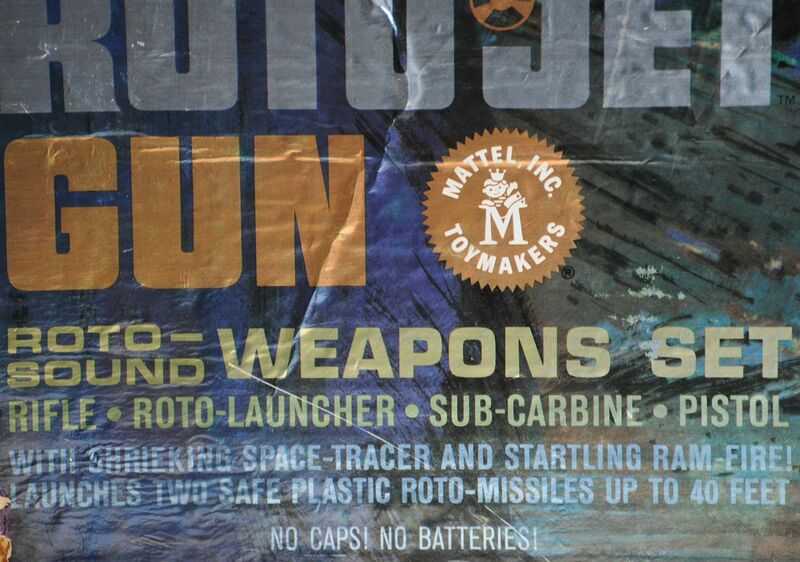 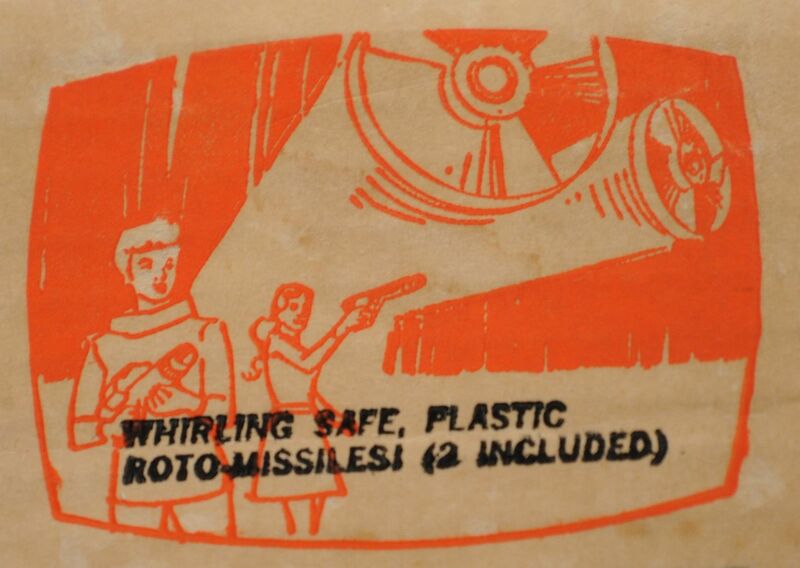 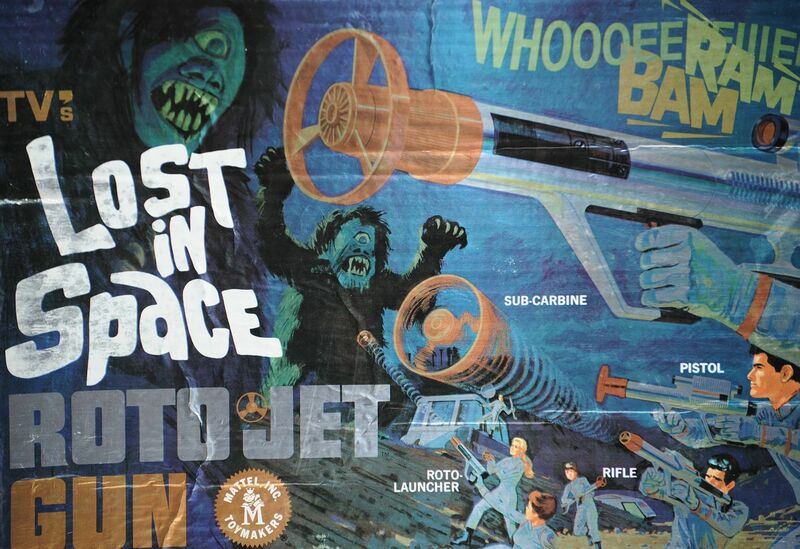 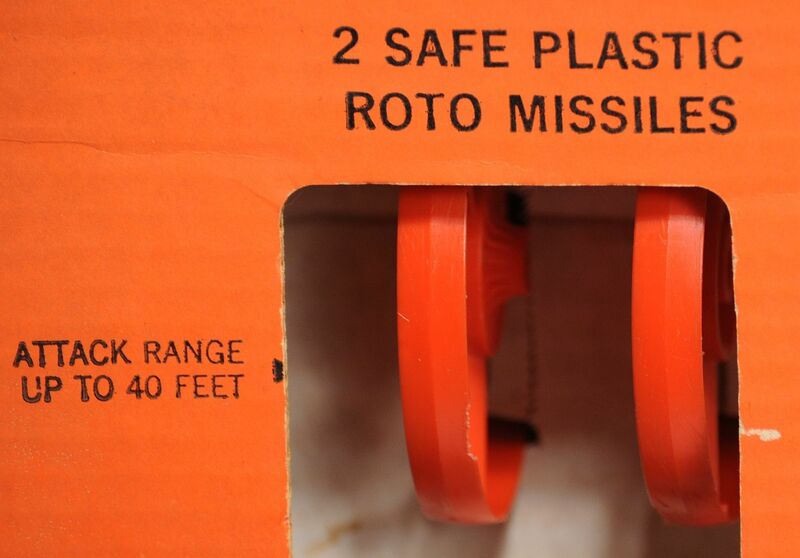 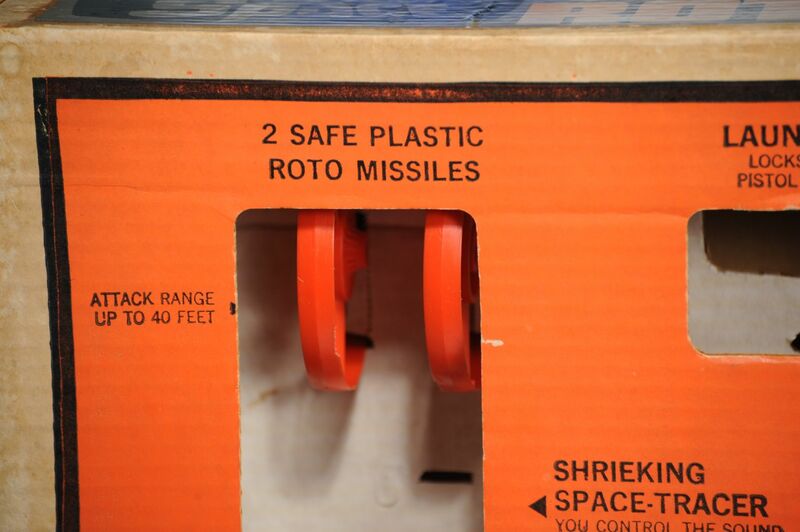 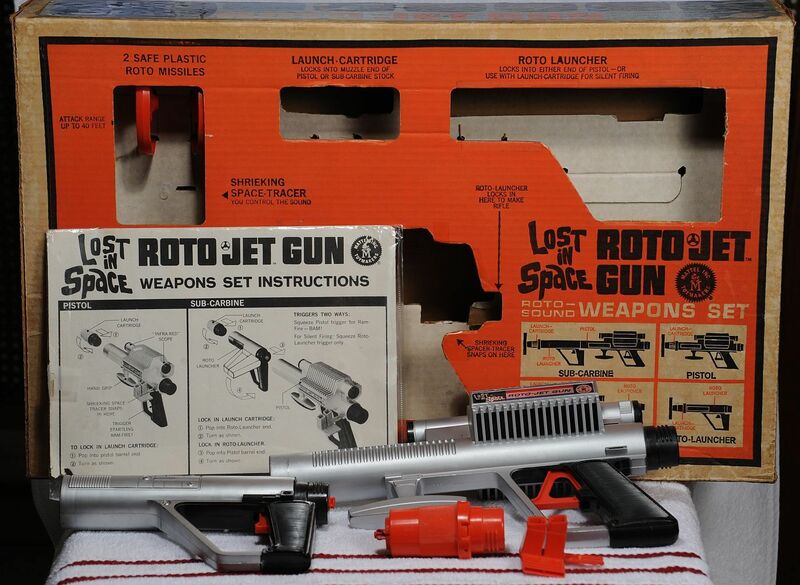 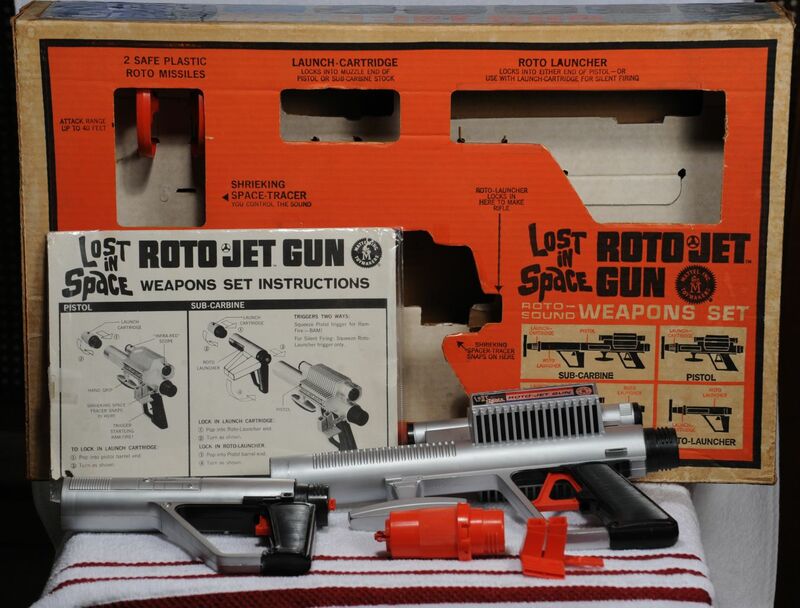 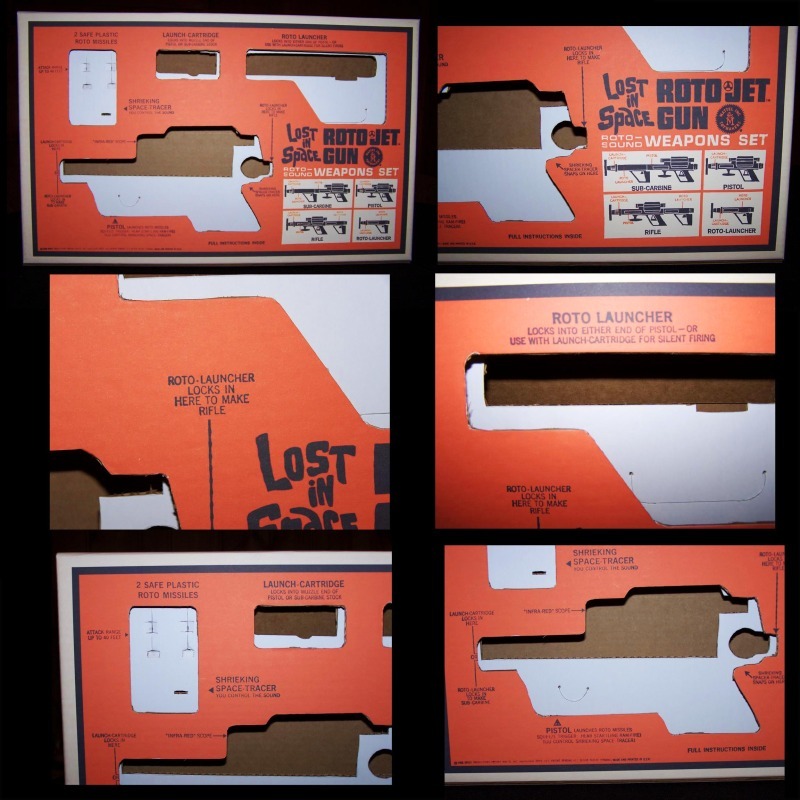 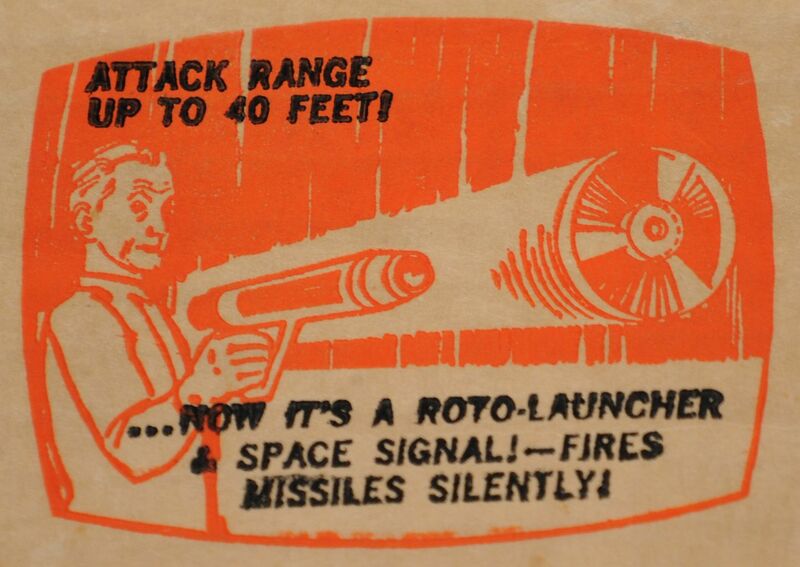 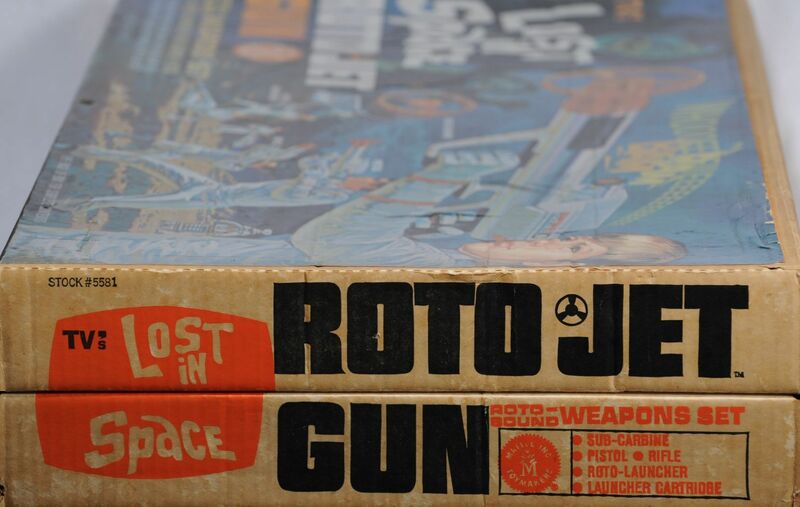 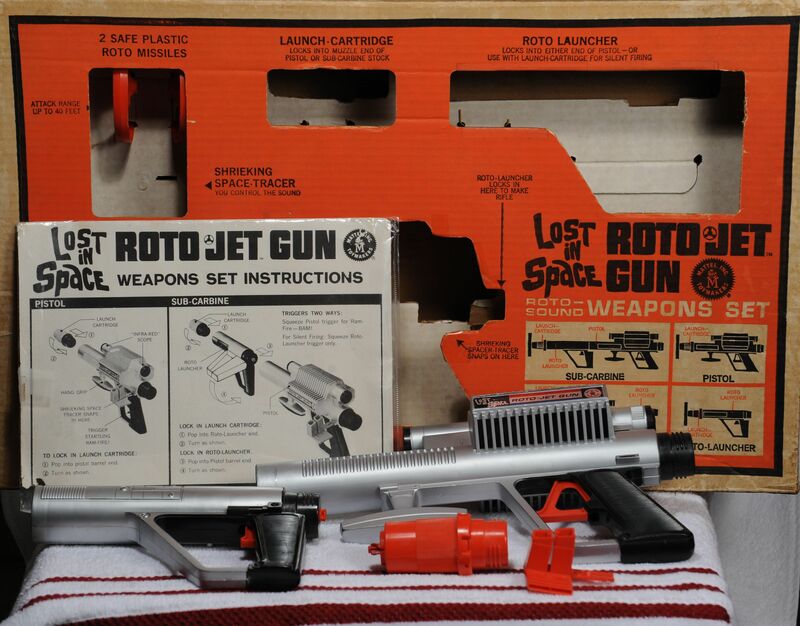 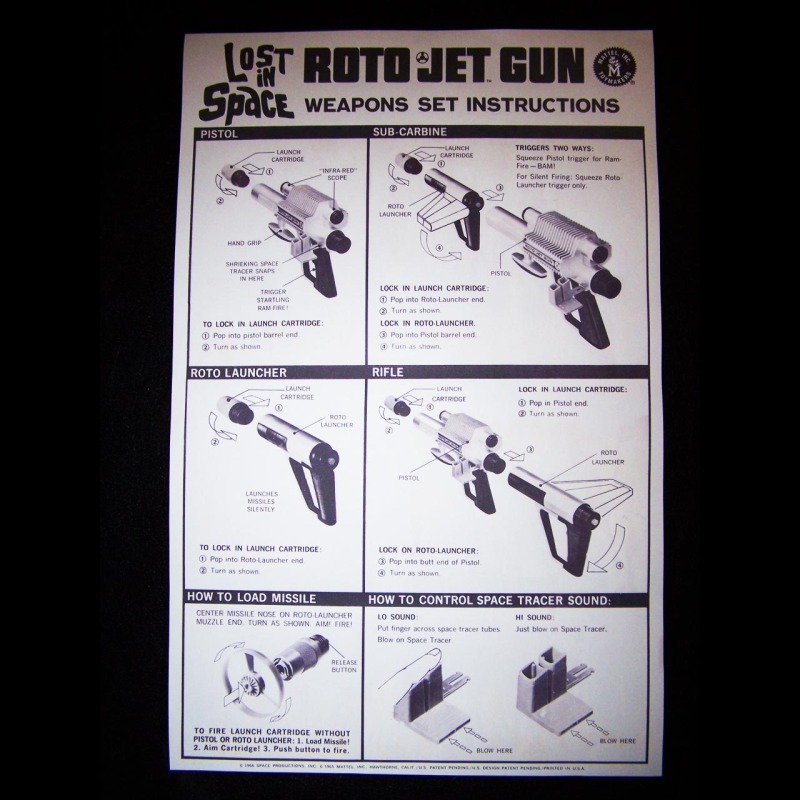 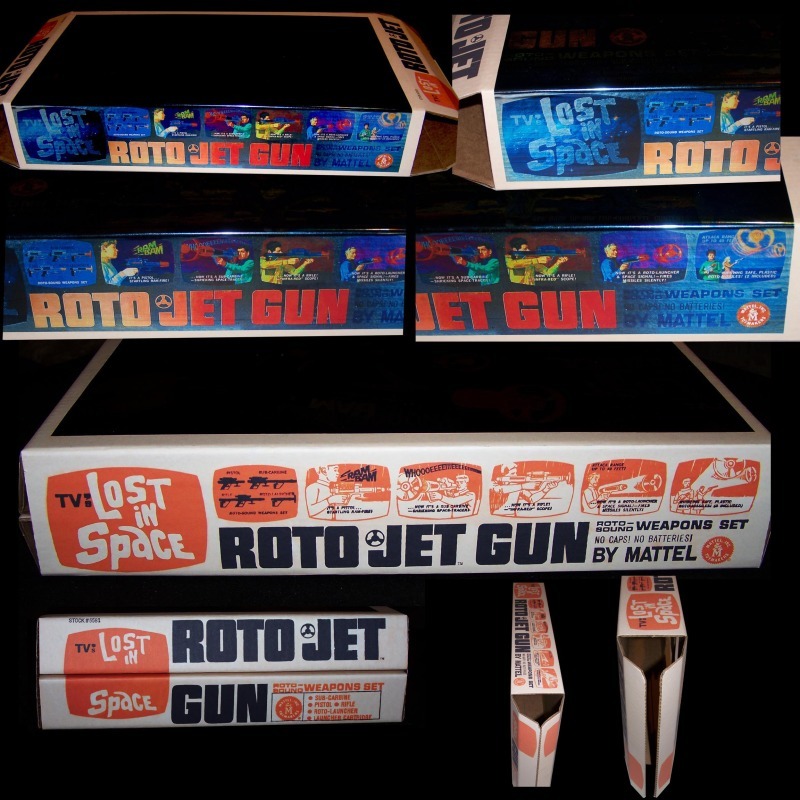 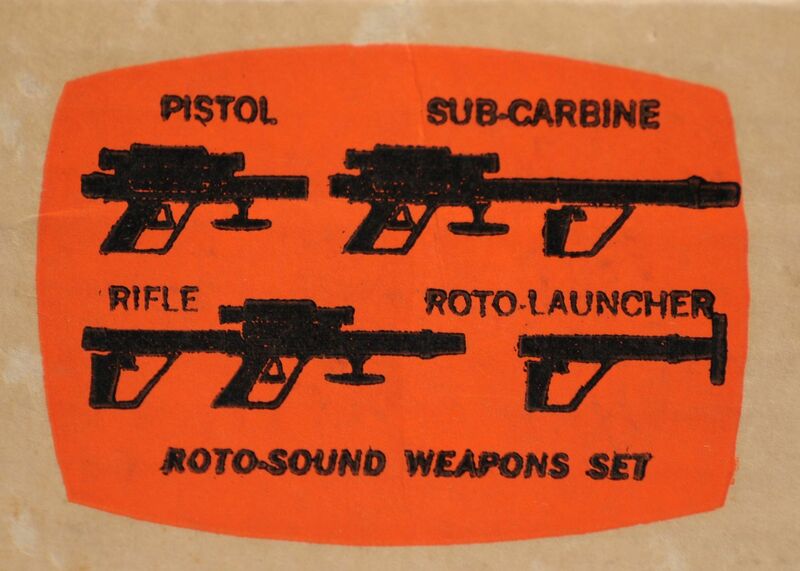 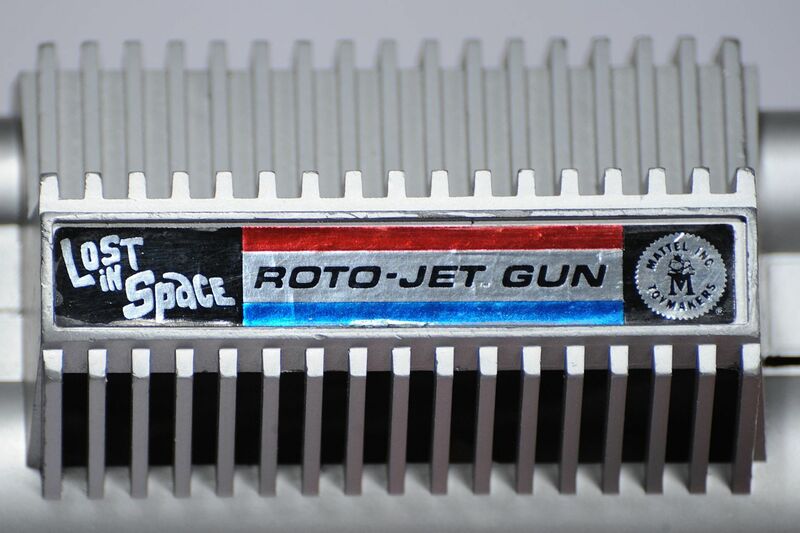 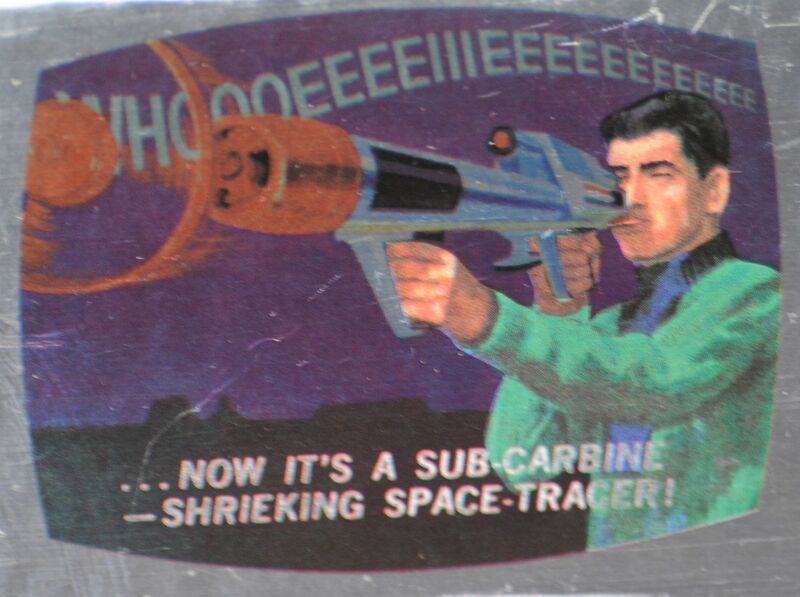 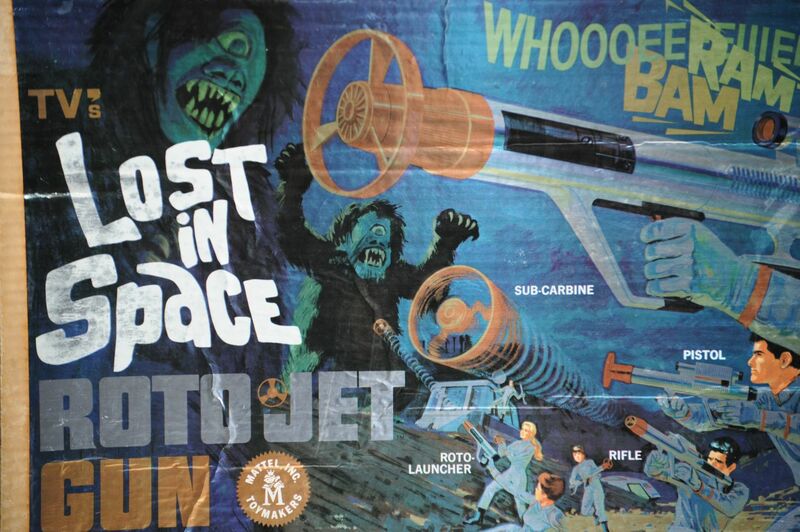 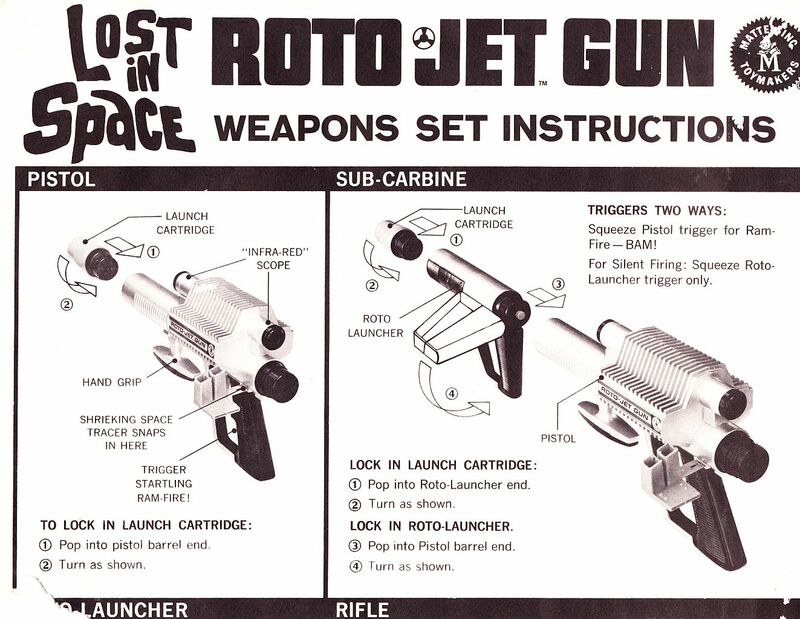 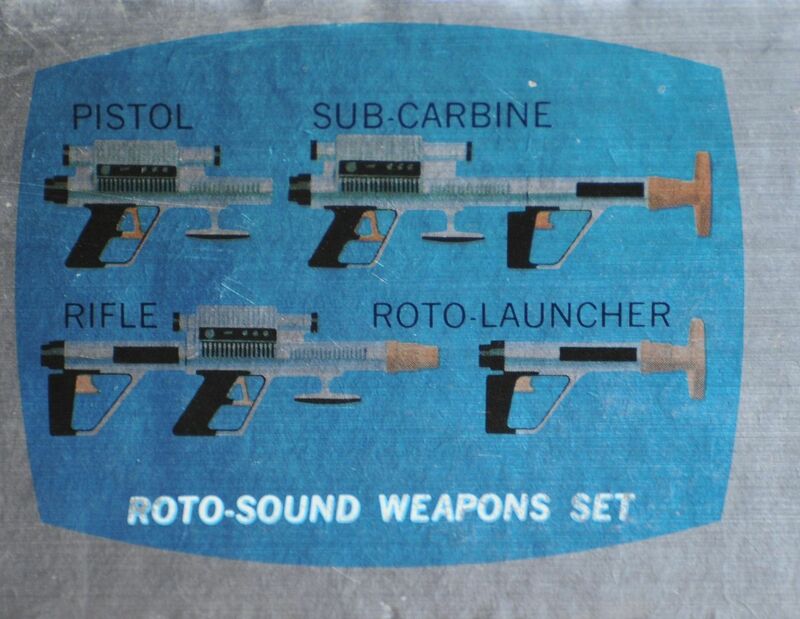 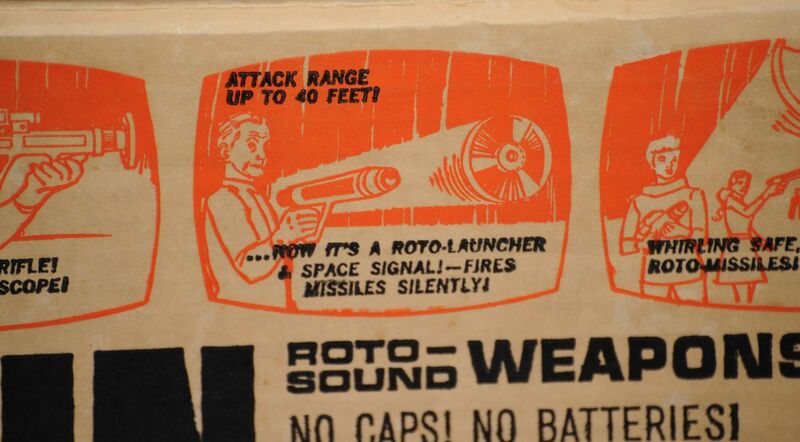 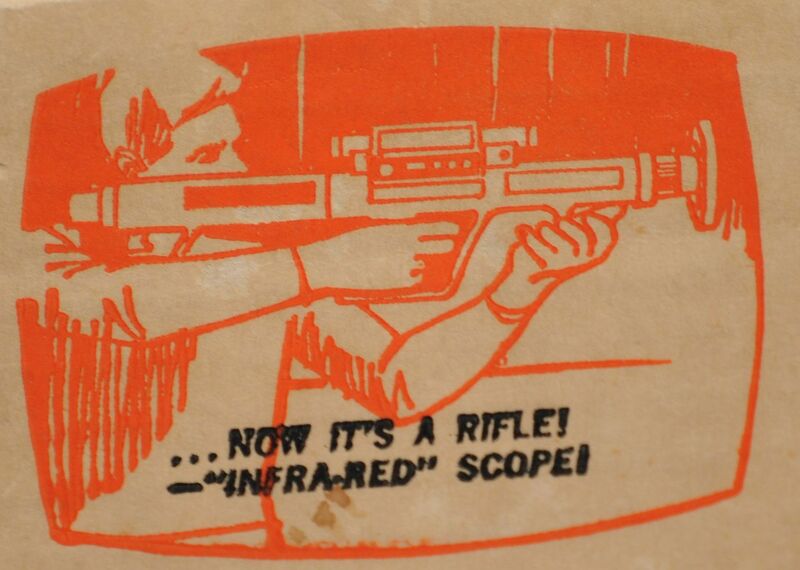 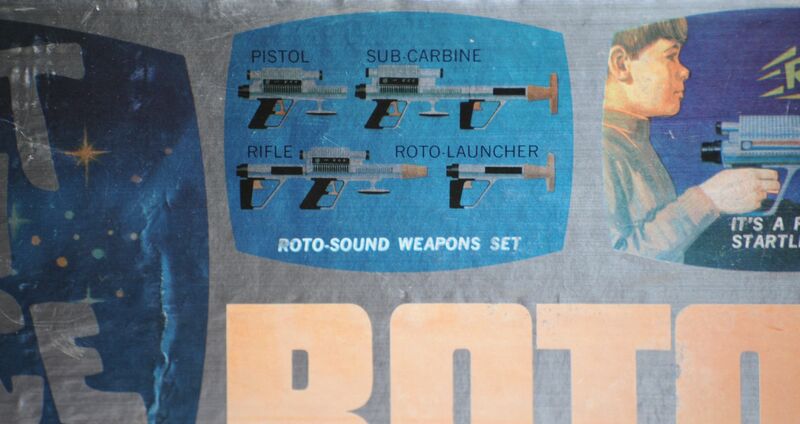 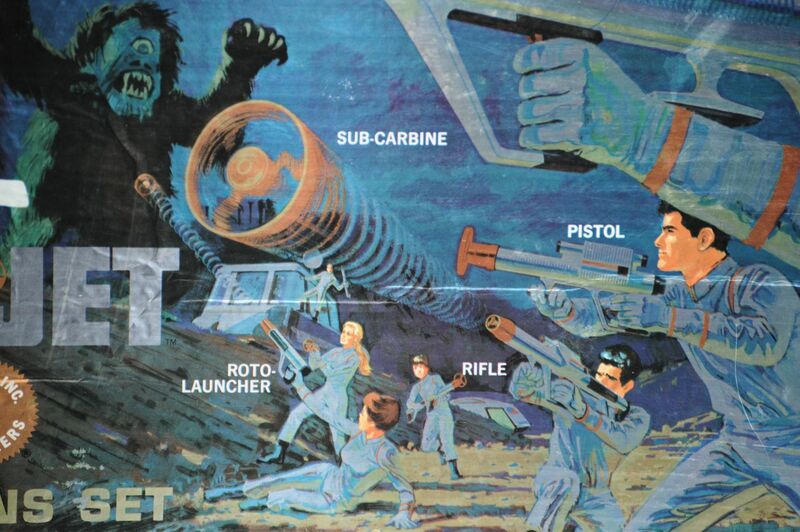 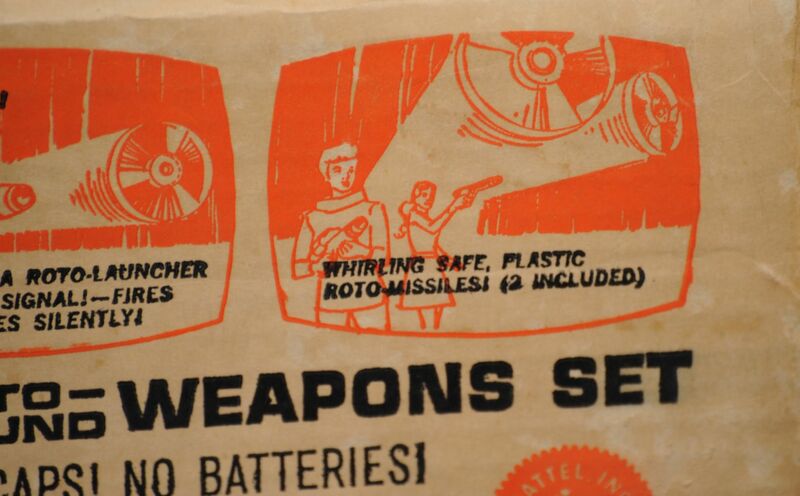 On June 10, 2001 a mint sealed Roto Gun again hits the eBay auction site. 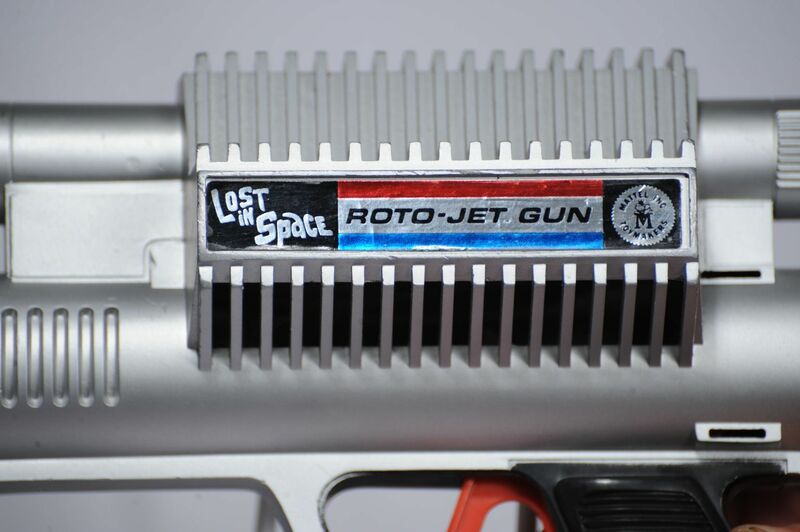 This is the 1st ever that a sealed Roto Gun has been sold. 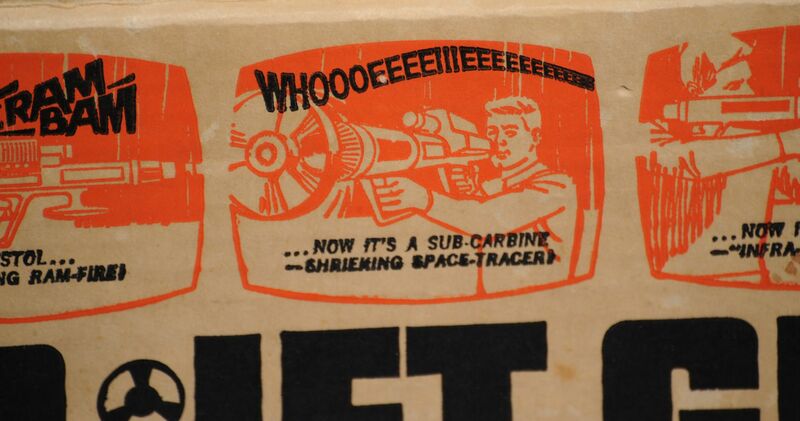 After the 1st day of bidding the seller removed the item for auction. 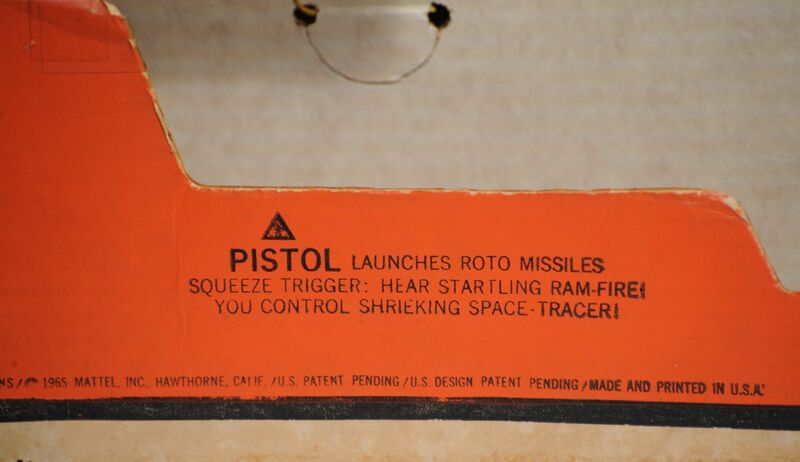 The price was at, $10,300. 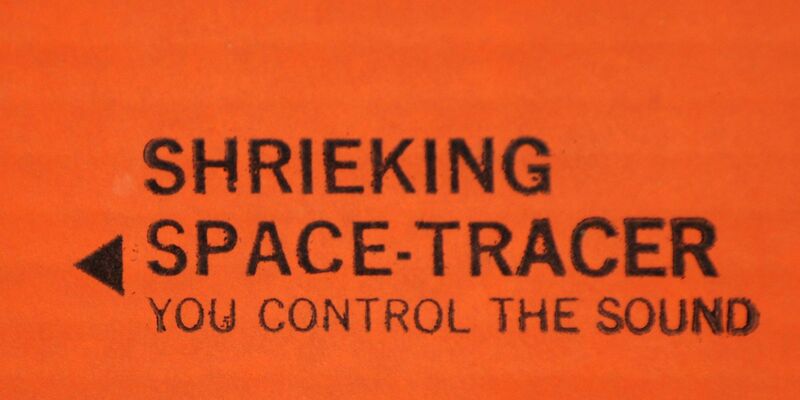 with 4 days left in the auction. 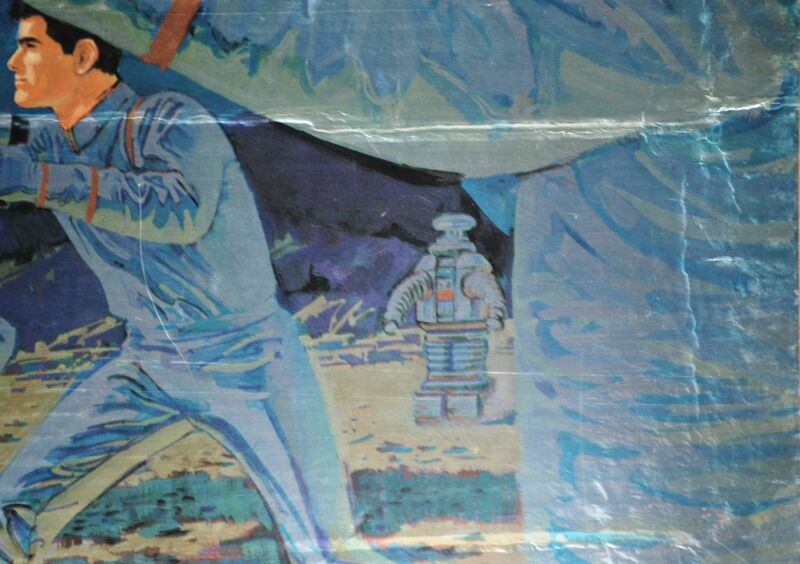 I contacted the seller, who was selling it for a friend. 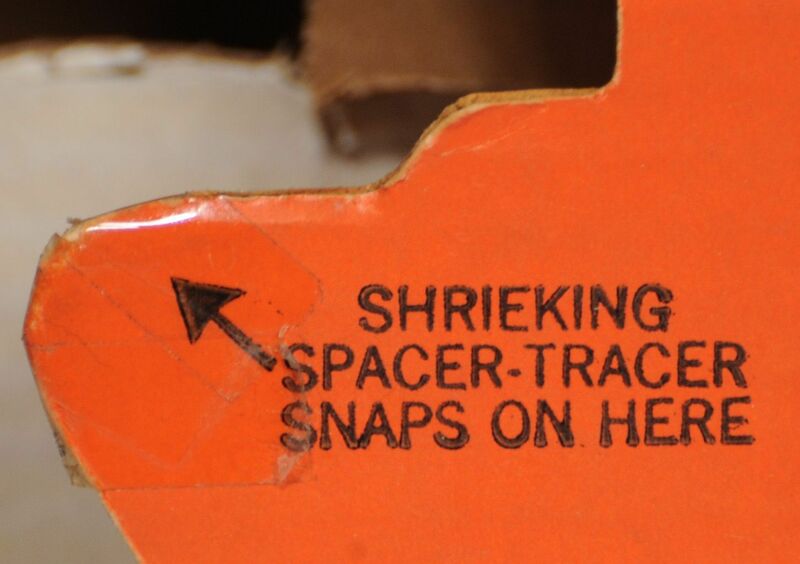 He decided to keep the item, and was not aware of it's current value. 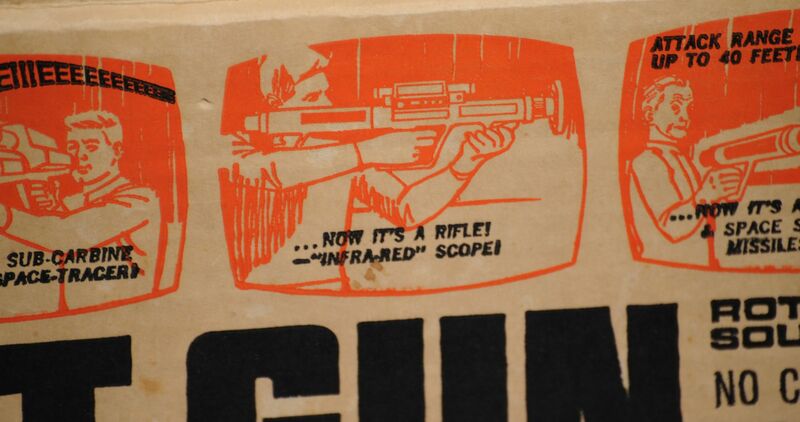 If this auction would have continued, I believe that it would have reached the, $20,000 mark!? 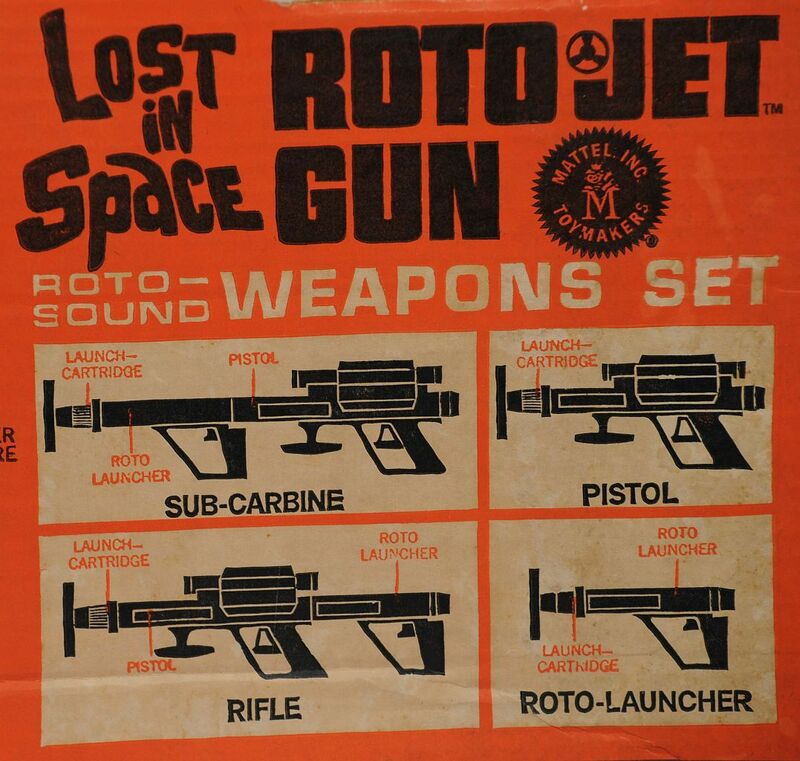 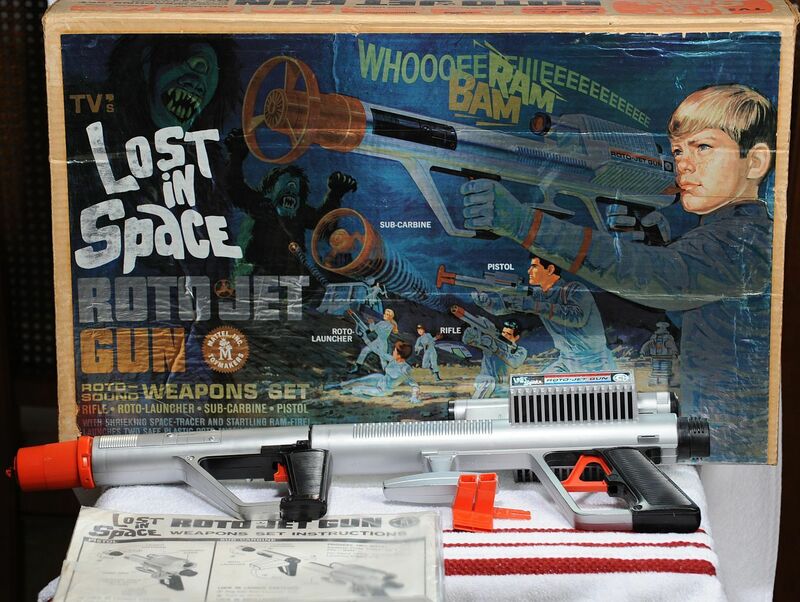 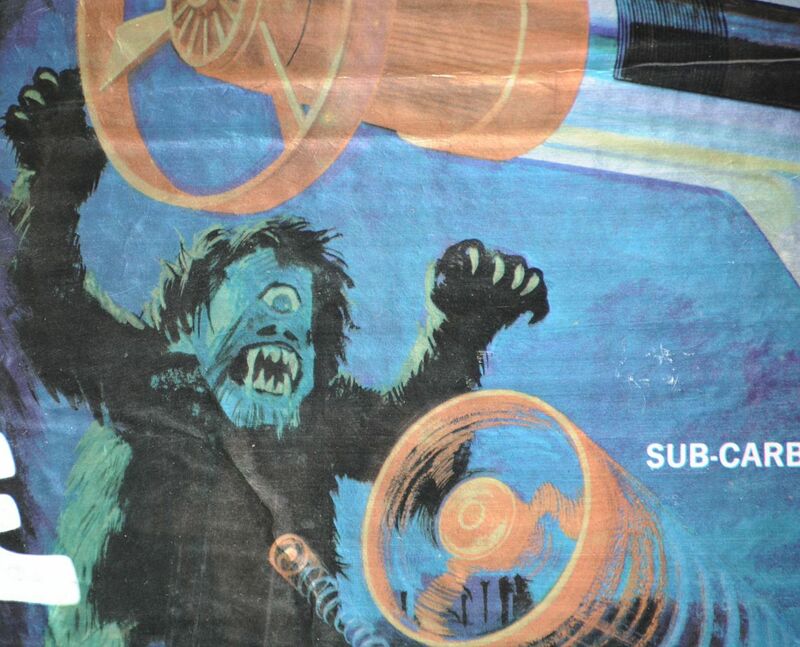 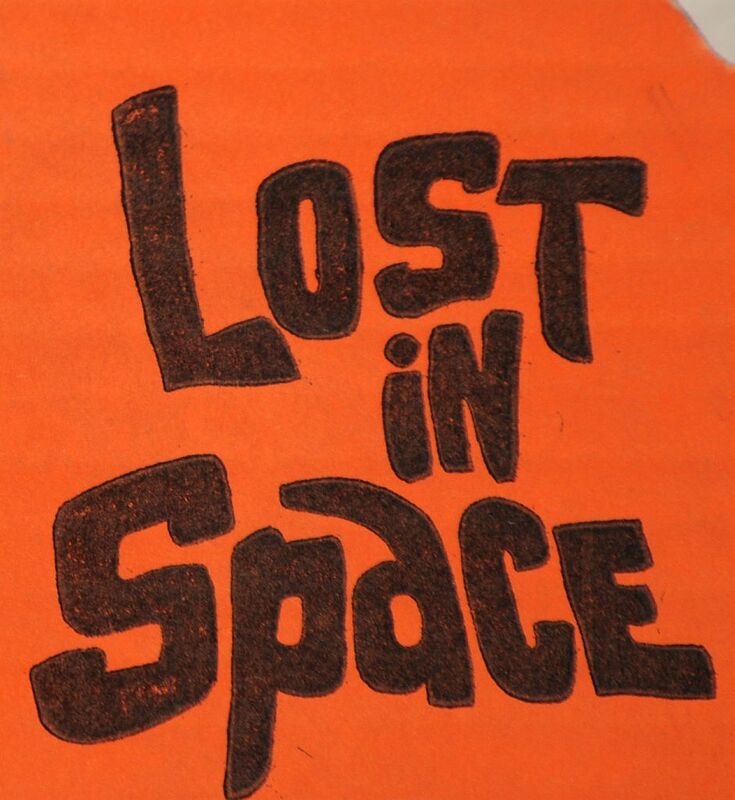 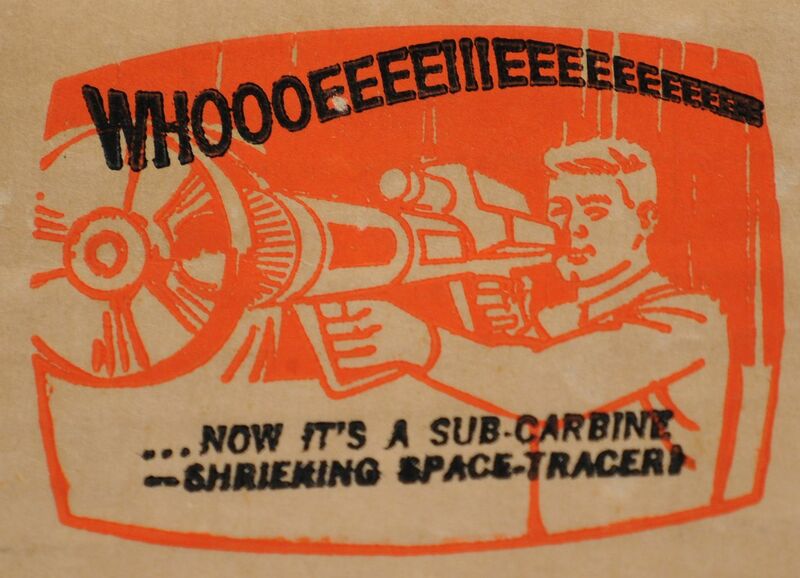 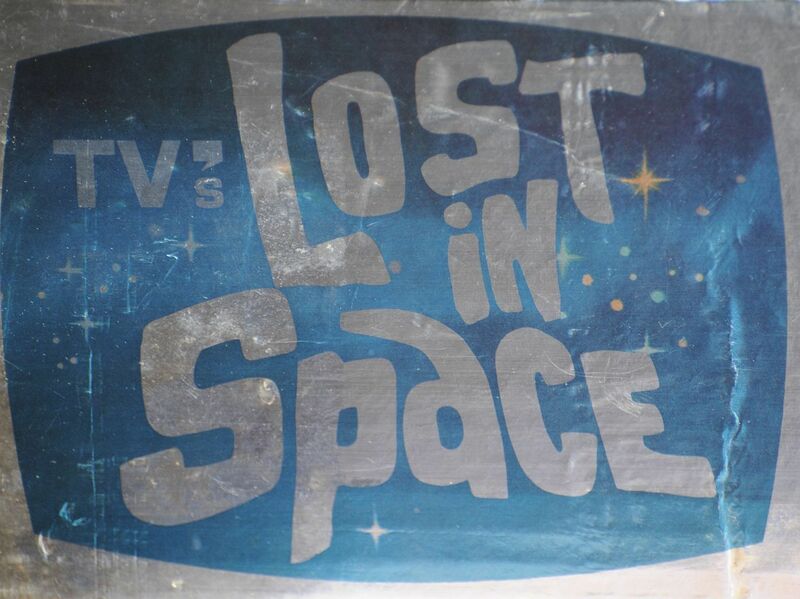 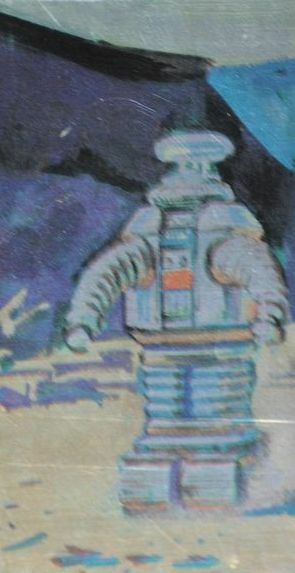 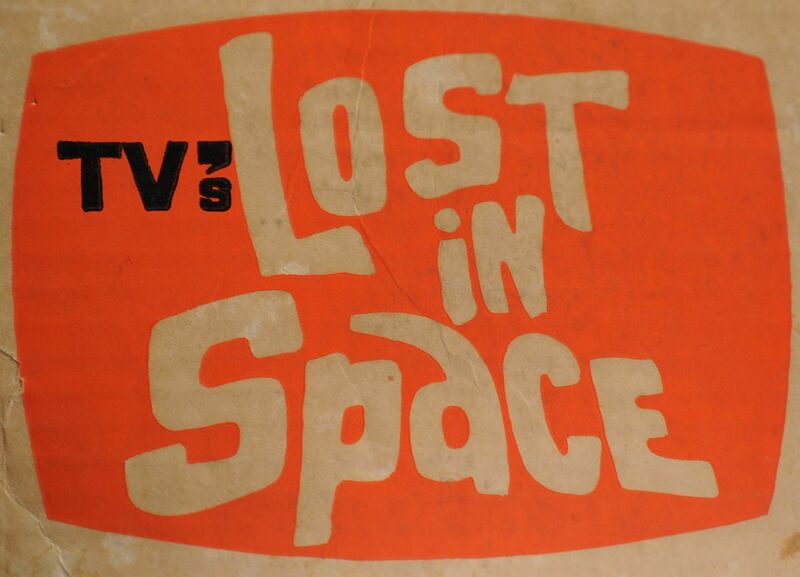 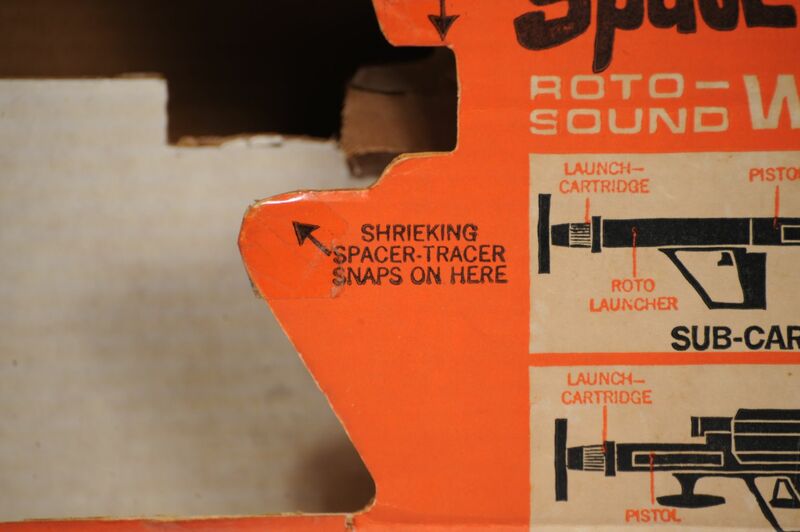 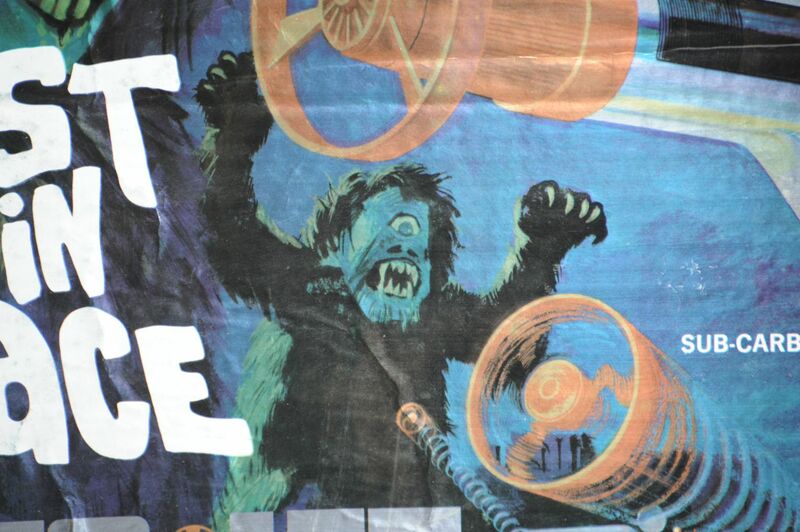 This is the rarest of all "Lost in Space" vintage items to obtain. 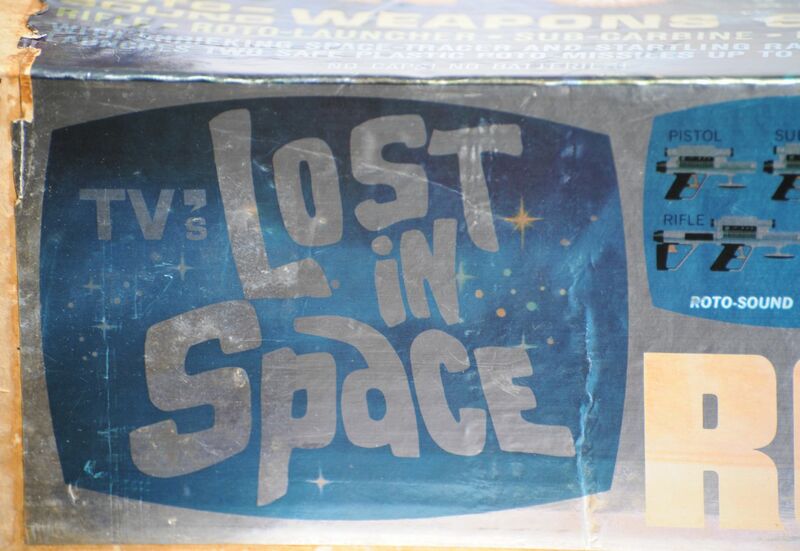 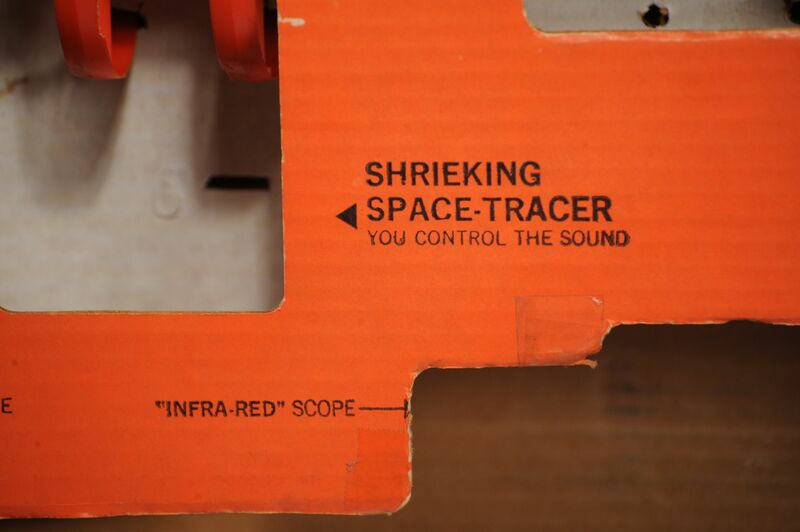 On 1/01/02 another one of these rare box toys came up for bid on eBay auction. 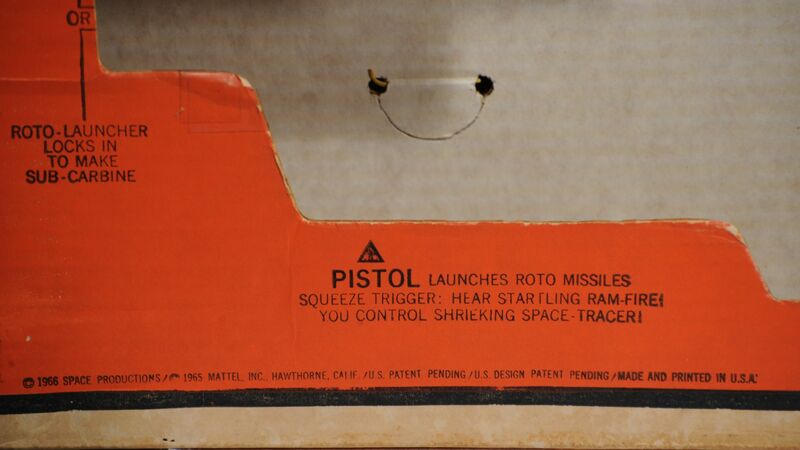 The auction closed with 24 bids not meeting the reserve asking price, and a high bid of, $6,100.00. 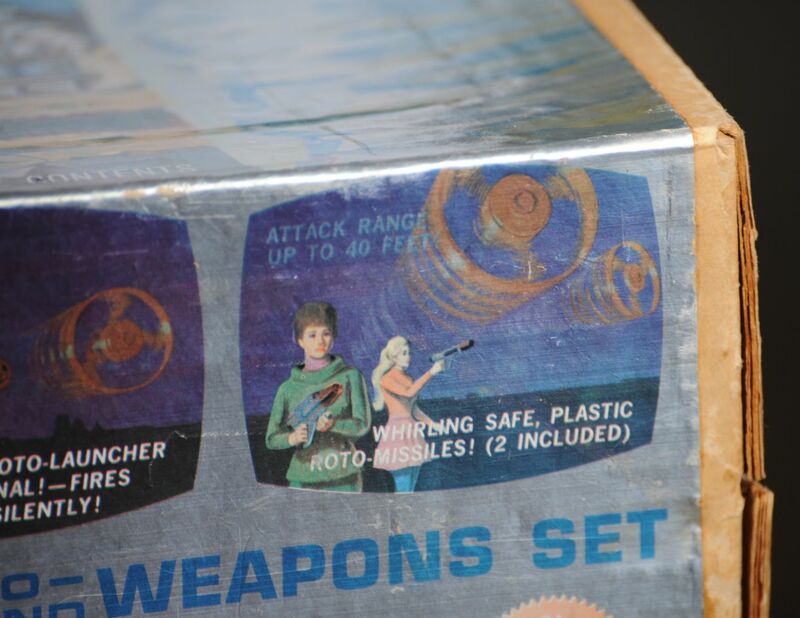 This was the same sealed toy on June 10, 2001. 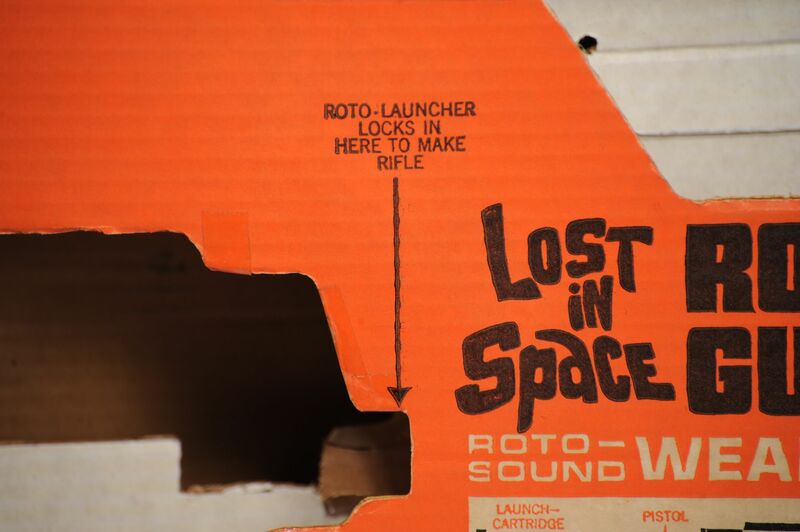 Recently I spent endless hours taking photos on this rare treasure. 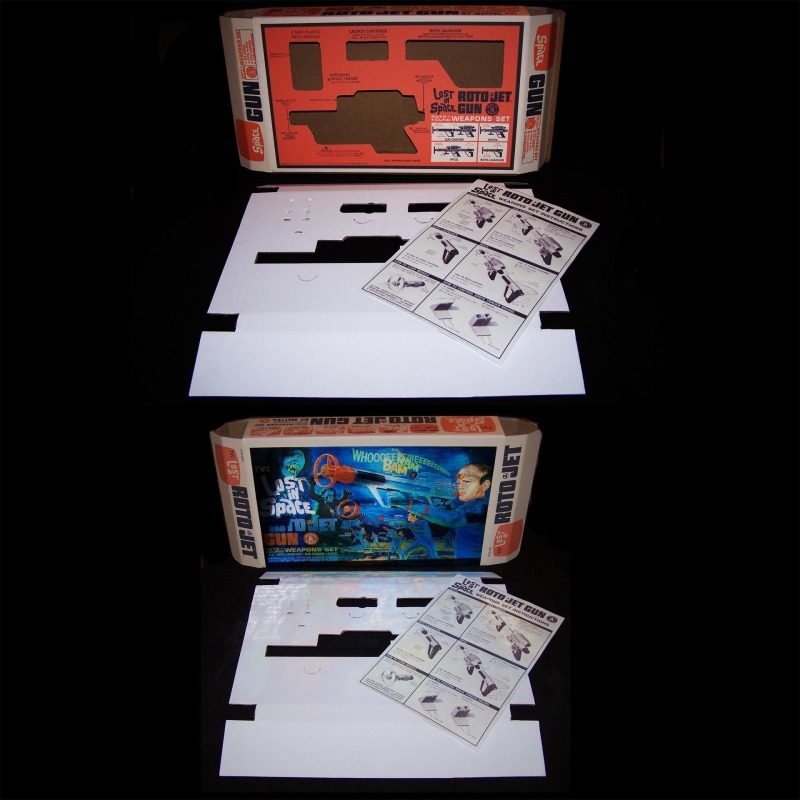 Every angel, every image on this box was taken to showcase on our website!